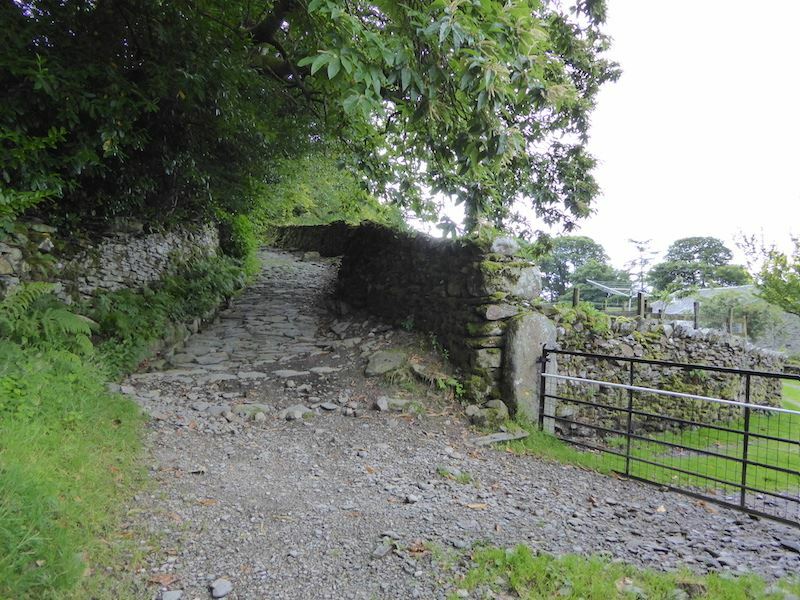 We set off from the parking area just below the church at Troutbeck, walk over the pedestrian bridge and then along the road up to the Garburn Road path. Making our way up the Garburn Road. 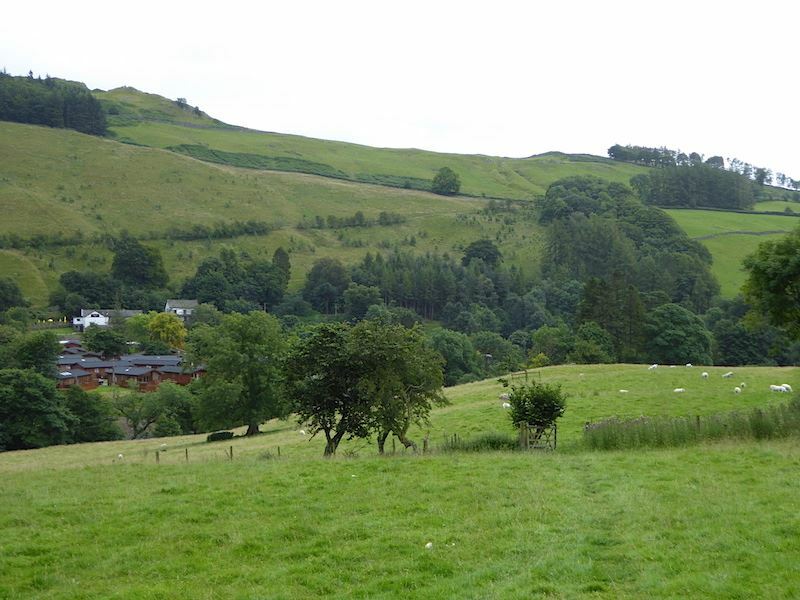 A view over Troutbeck to Wansfell, with the dark mound of Troutbeck Tongue over on the far right. 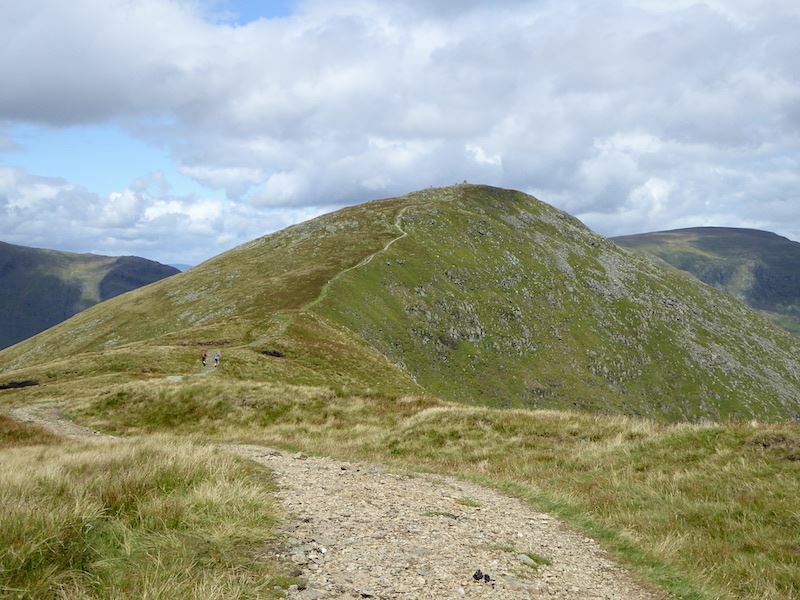 Troutbeck Tongue, in the centre, will be the last summit of the day. But first we are heading for the ones covered in cloud on the right. It looks very dramatic and atmospheric over there at the moment. There’s a lot of cloud action on the horizon, I hope it won’t stay around too long. 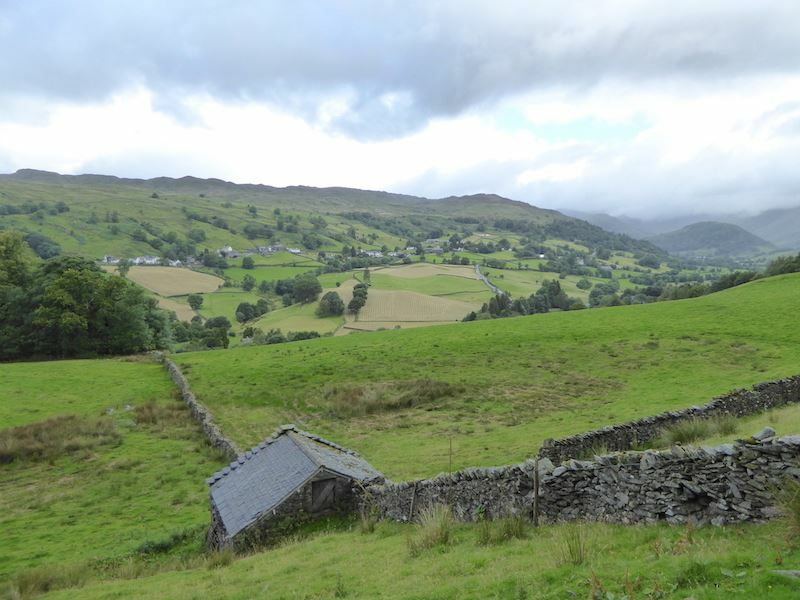 A view along the Troutbeck valley. 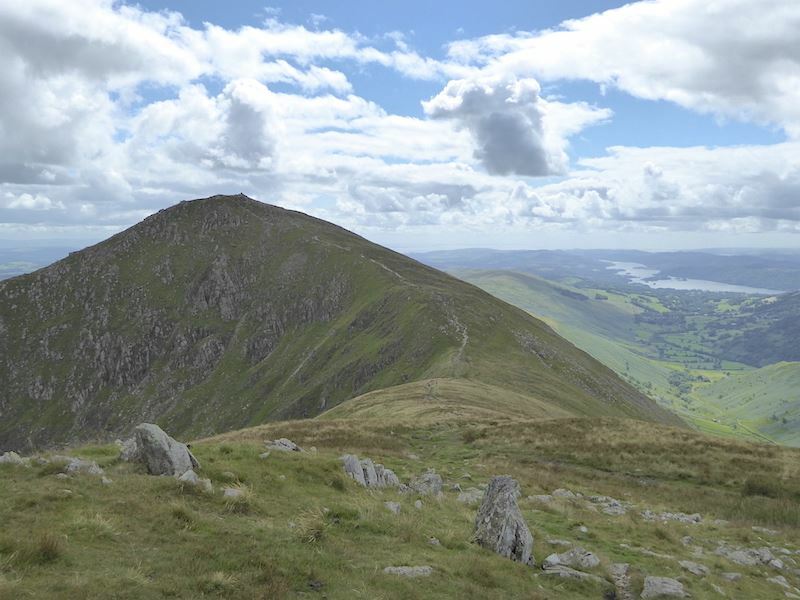 Over on the right is Yoke which will be our first summit today. 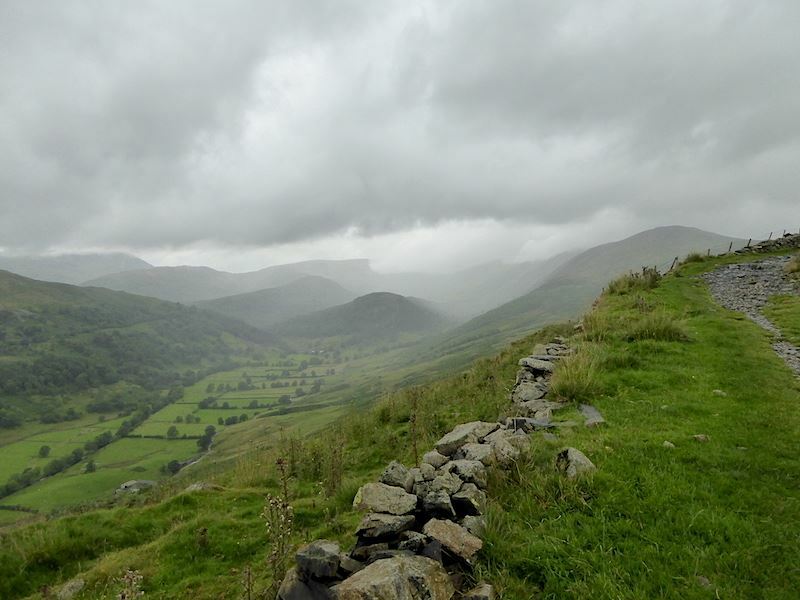 My hopes take a nose dive as we climb higher up the Garburn Road, the weather gets greyer and windier and a rain shower hits Troutbeck Tongue. 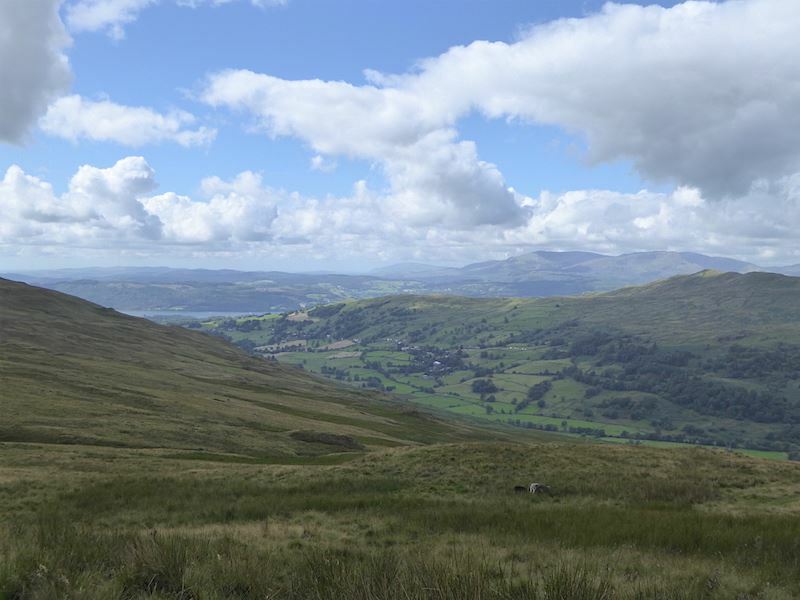 On the left horizon and blanketed by the swirling cloud is Red Screes. 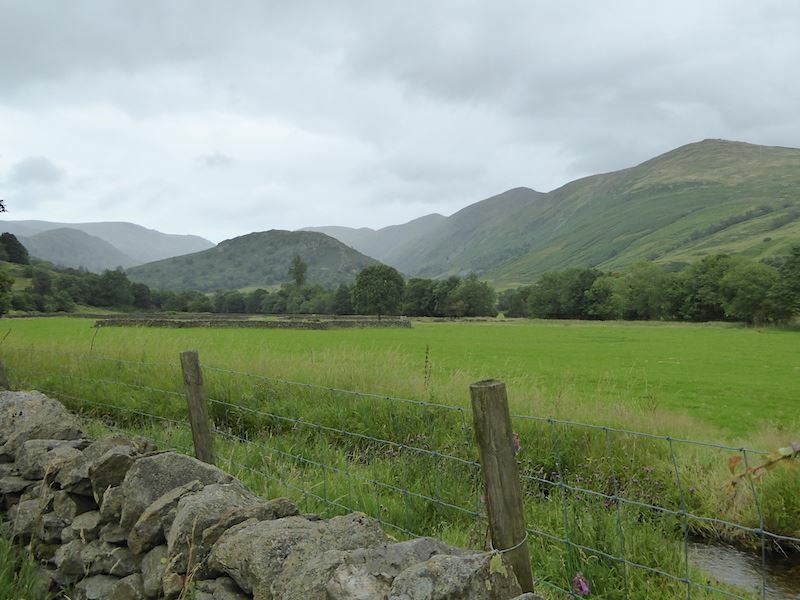 As we leave the Garburn Road and join the path up to Yoke we stop and look southwards. The weather is coming to us from there and its looking brighter. The sun still hasn’t reached us as we head up the path towards Yoke and its very chilly. We begin to wonder if that blue sky will ever reach us. 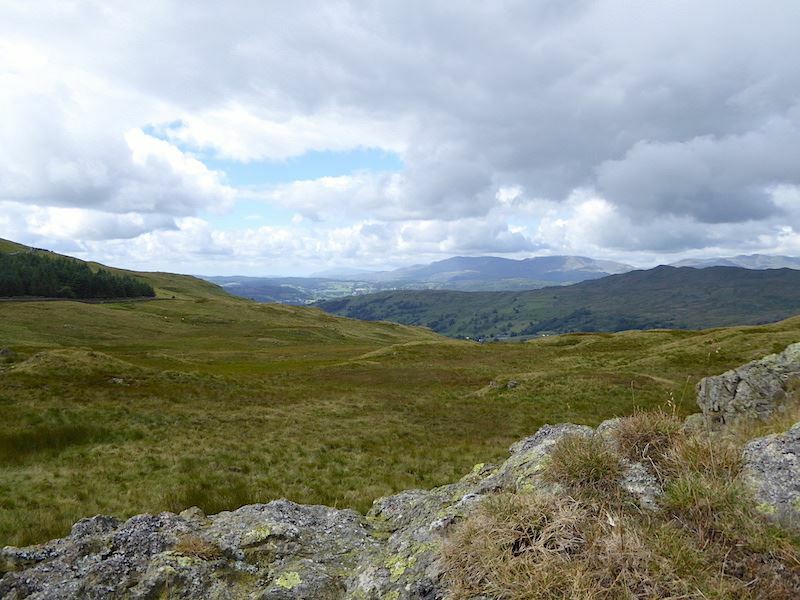 On the skyline to the right the Coniston fells have some sunshine. 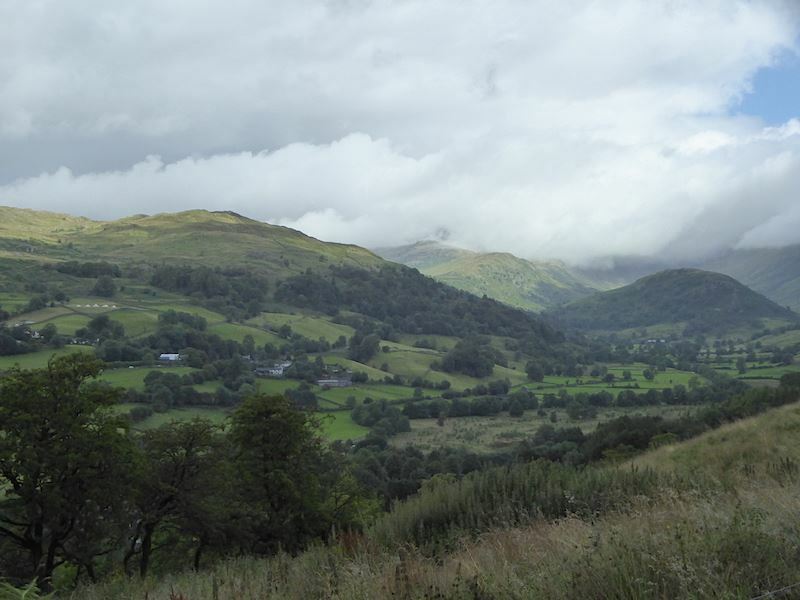 To the west of us Red Screes is getting some sun, we are still under the clouds. 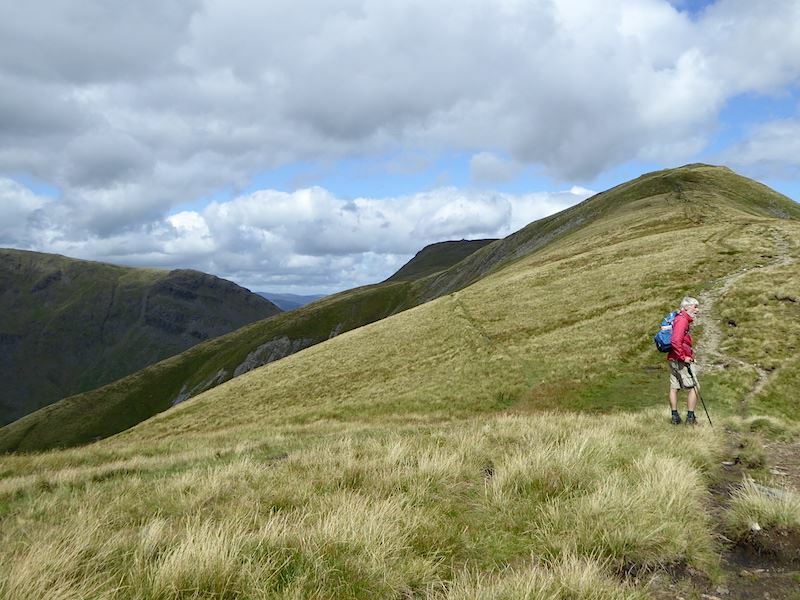 At last, a spell of sunshine as we begin to see the summit of Yoke, but there’s still a way to go though. 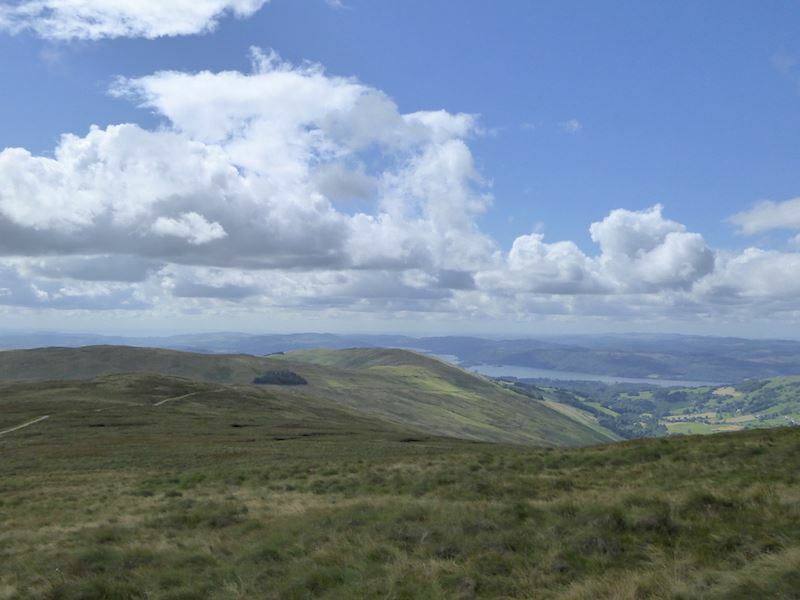 Looking over to Windermere with Sour Howes and Sallows to the middle and left. 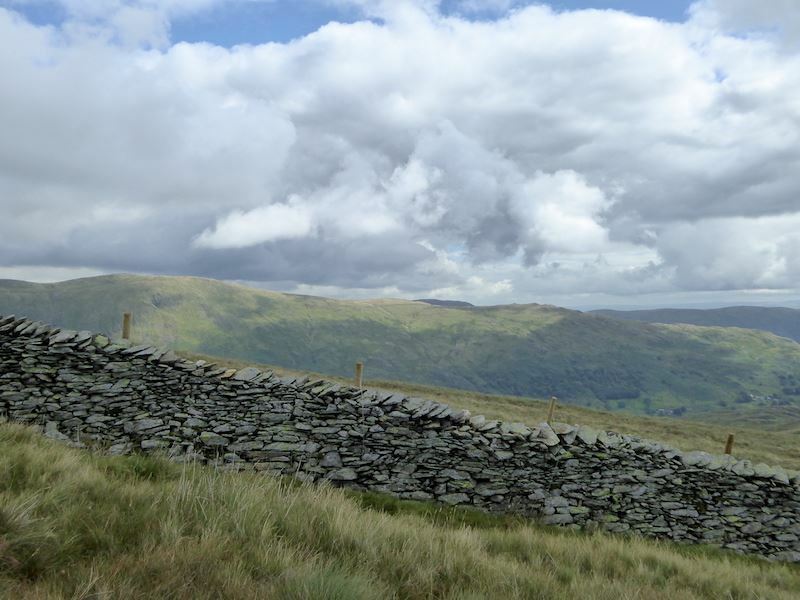 Over the wall to the east is Kentmere Pike, left on the skyline, leading down to Shipman Knotts on the right. There’s a lot of cloud activity going on over them too. Its interesting to watch but it does make things feel very chilly. 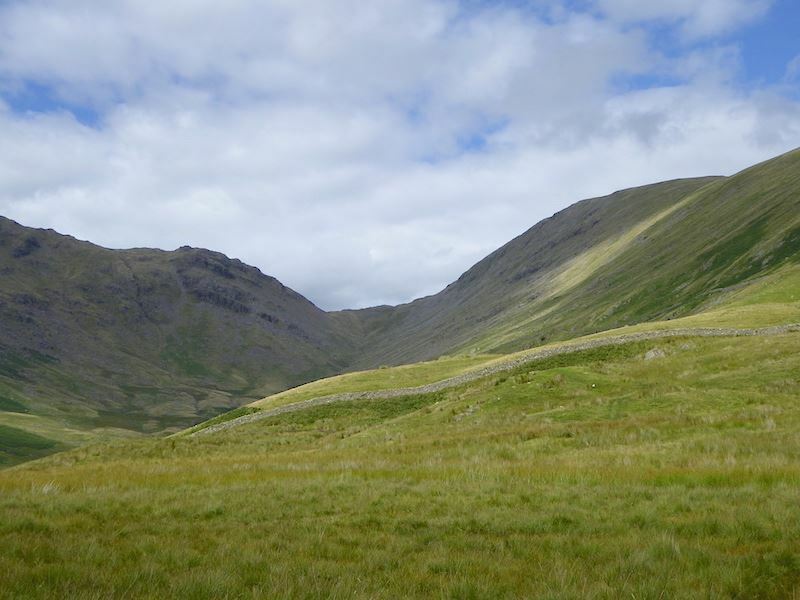 Still walking towards Yoke, with the summits of Ill Bell and Froswick peeping out behind the grassy slope. 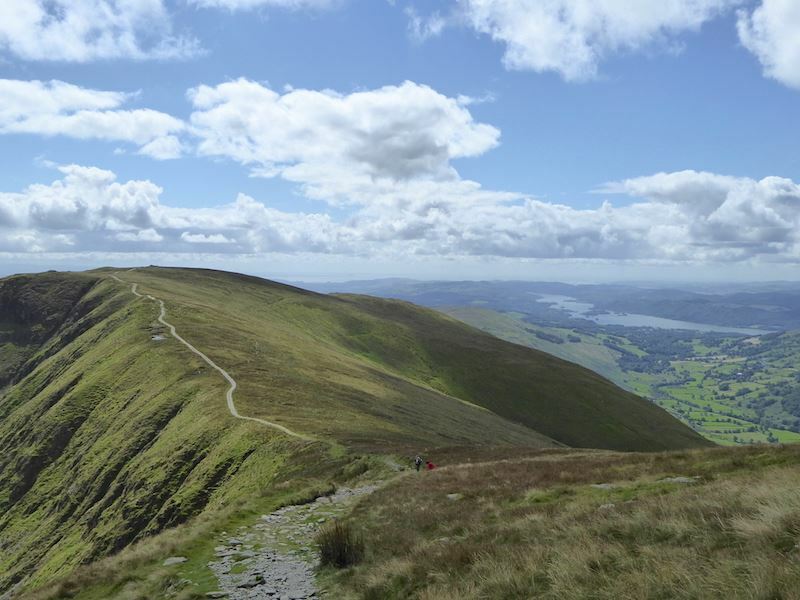 A look back along the path for a view of Windermere with Wansfell over on the right. 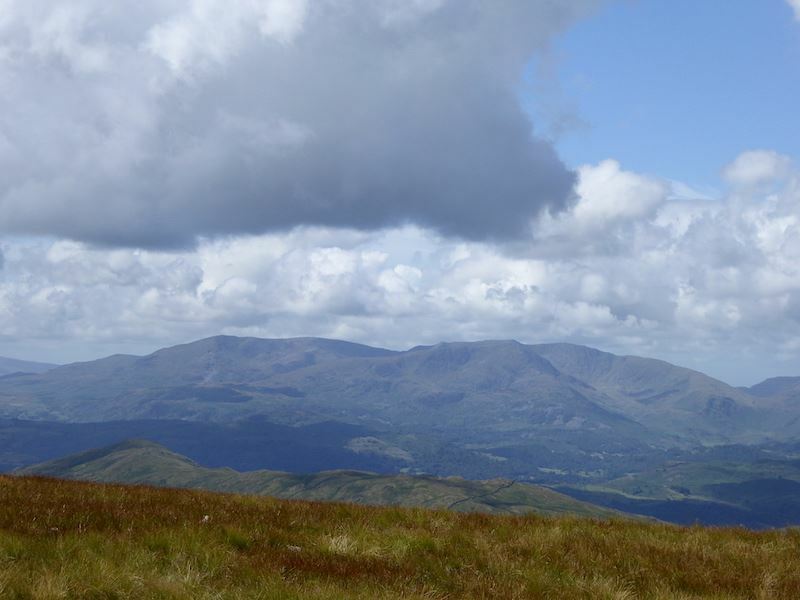 On a windy and cold Yoke summit, Ill Bell just behind, with High Street on the centre skyline. 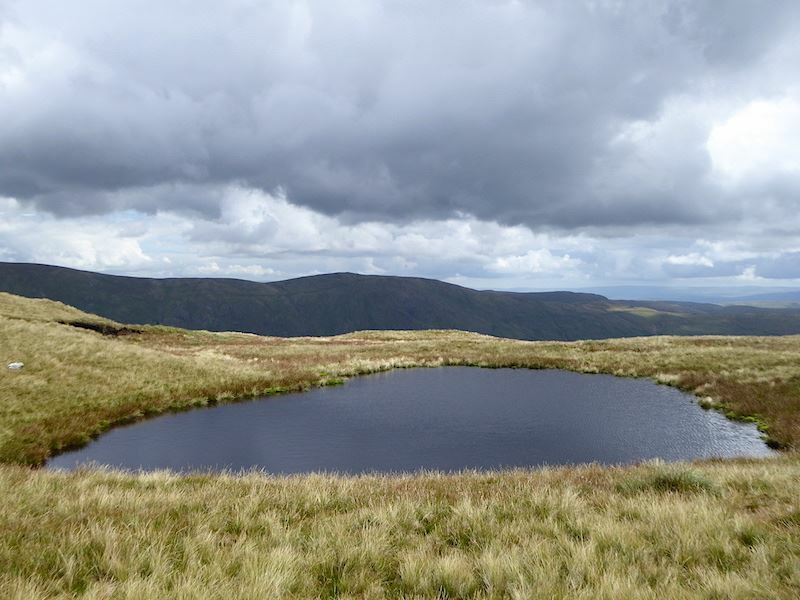 A short pit stop on Yoke and a chance to have a look at Ill Bell. I could have done with a bowl of hot soup at this point but as its supposed to be the middle of summer I’d only packed fruit juices and water. 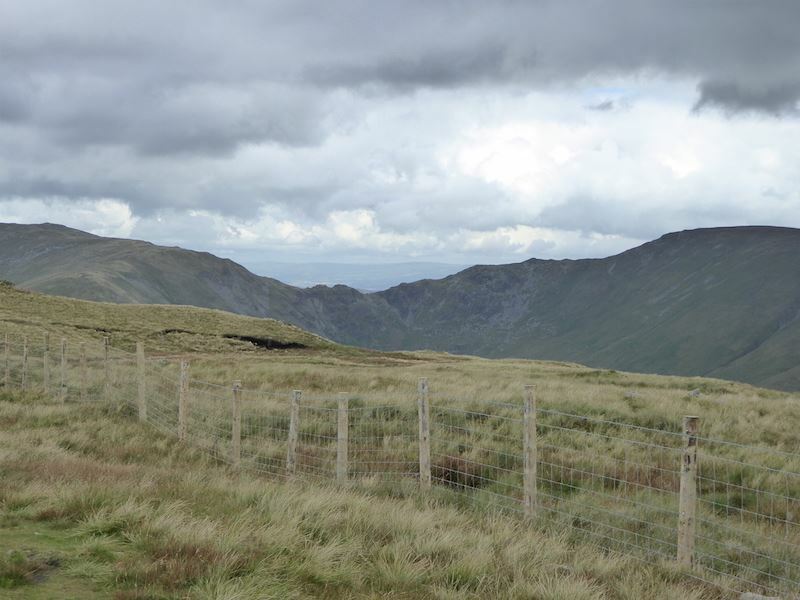 Nan Bield Pass in the centre, Mardale Ill Bell over on the left and Harter Fell over on the right. Blimey, its very chilly up here now. 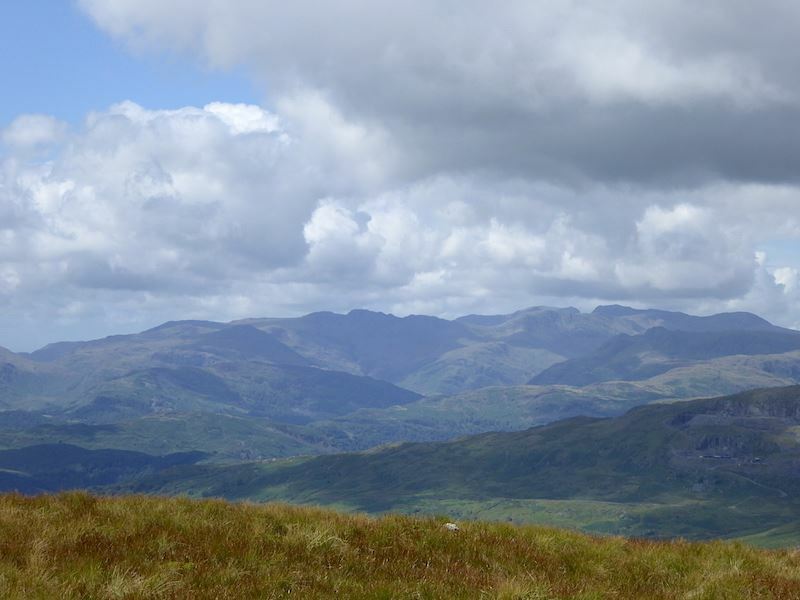 The Coniston fells enjoying some sunshine. Looking west from Yoke and wishing that sunshine was over us. 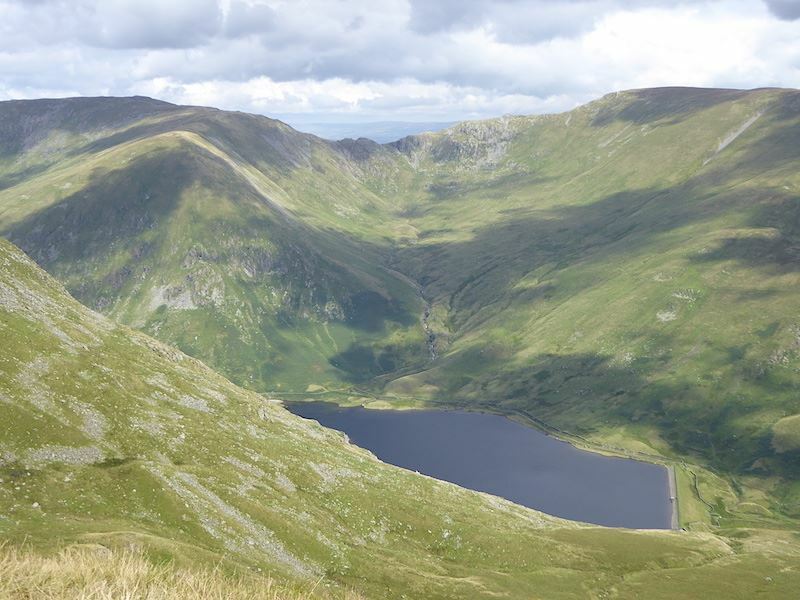 Looking across the tarn on Yoke to a very grim looking Kentmere Pike and Shipman Knotts. 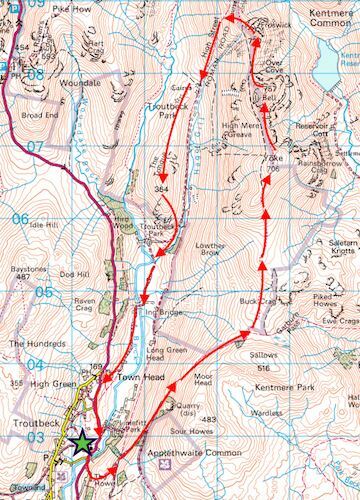 From Yoke we head off for Ill Bell, another patch of sunshine has landed on us, a bit of warmth at last, whoopee! 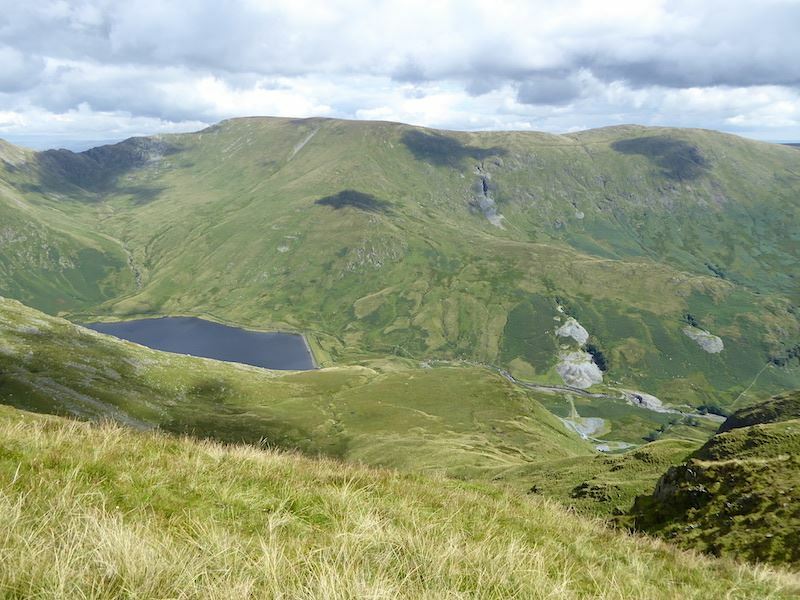 Down below us is Kentmere reservoir, towered over by Lingmell End on the left and Harter Fell on the right. 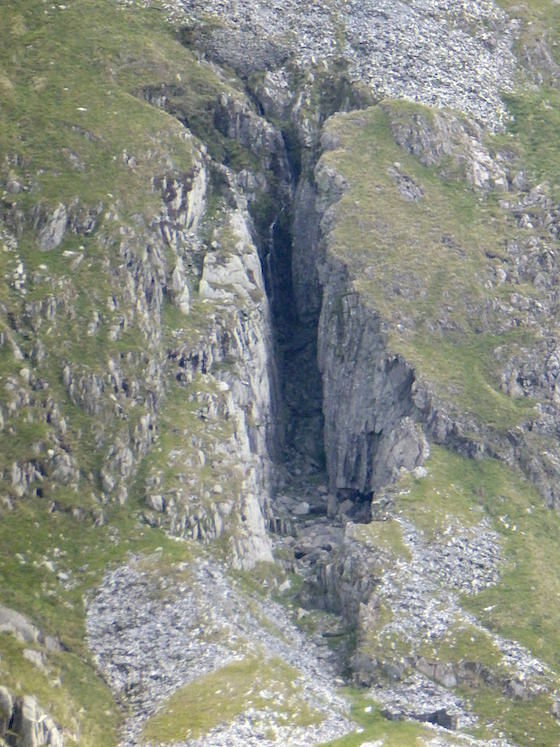 A great gash in the hillside opposite attracted my attention so I tried a close up of it. Zooming out now and the gash is visible across the valley, just under the middle cloud shadow. 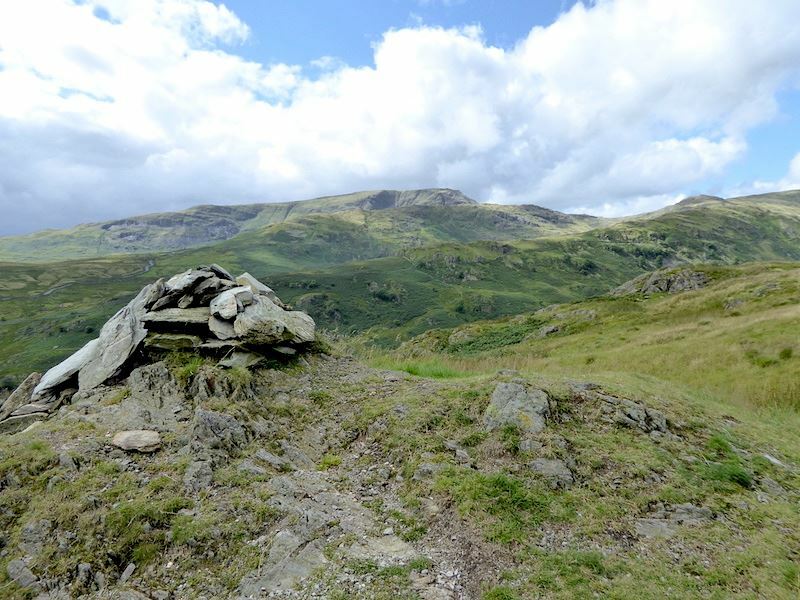 Lots of spoil heaps by the quarries on the lower slopes. 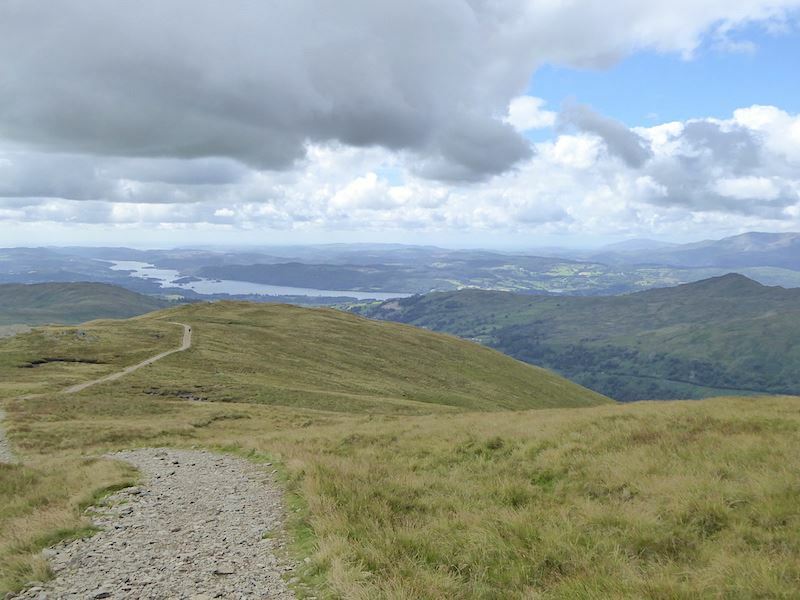 Looking back to Yoke on the left with Windermere over on the right. 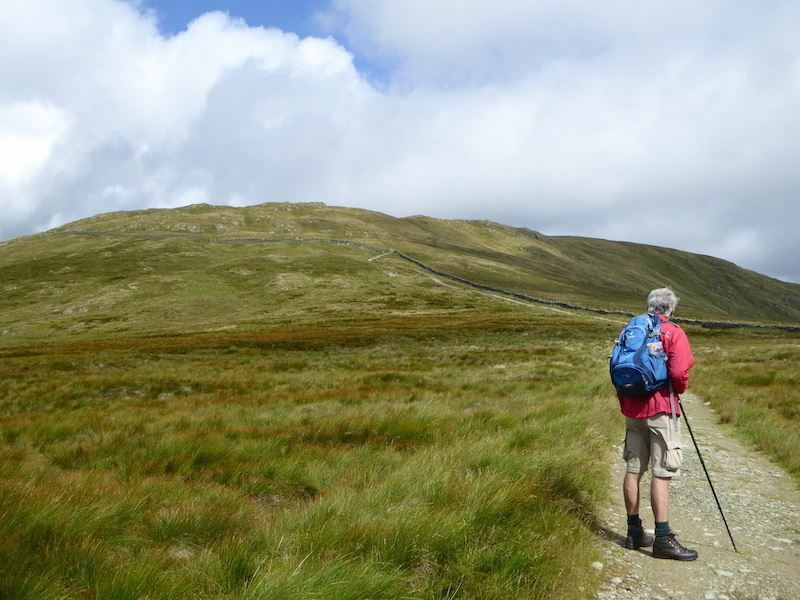 A closer look back at Yoke and the path we followed. 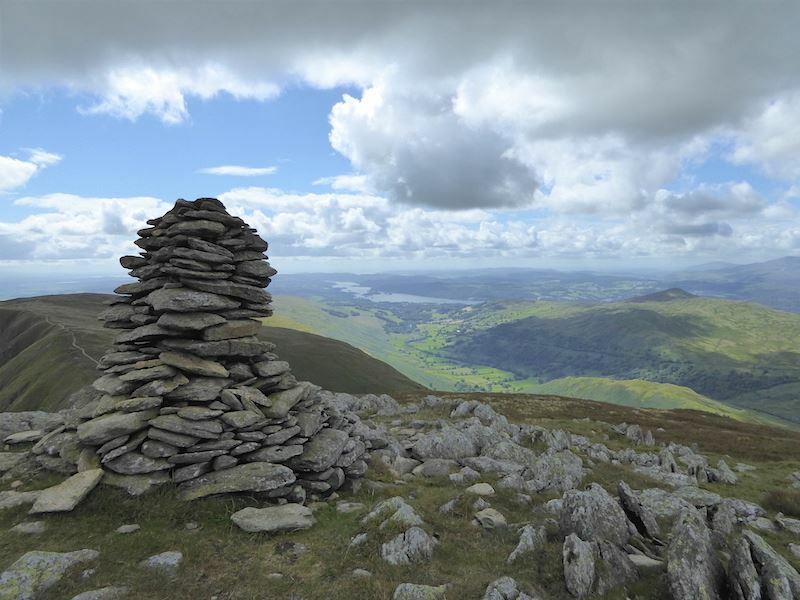 Under a dark cloud again at the first cairn on Ill Bell, here looking south to Windermere. 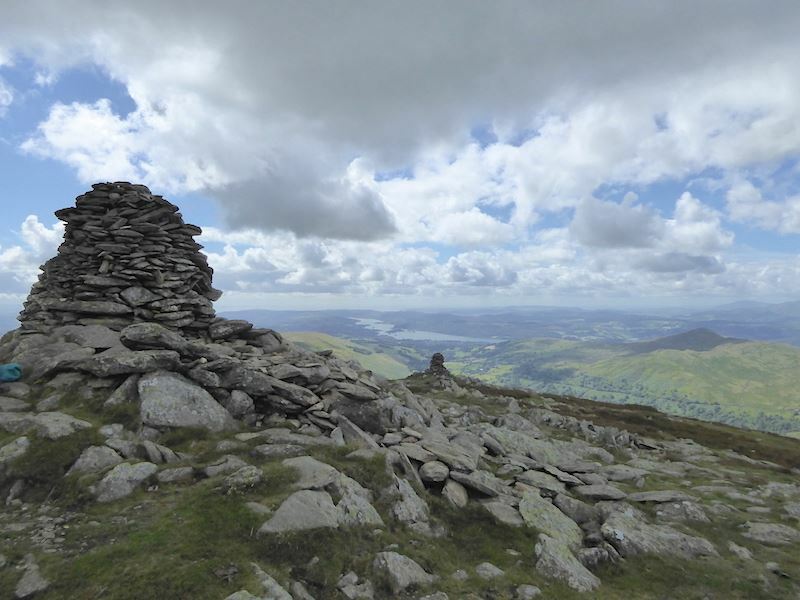 I took a couple of steps to the left for a different view of the cairn, Yoke and Windermere. Looking up at the next two cairns, lots of cairn hoggers up here, eating lunch with all their belongings spread out around them. 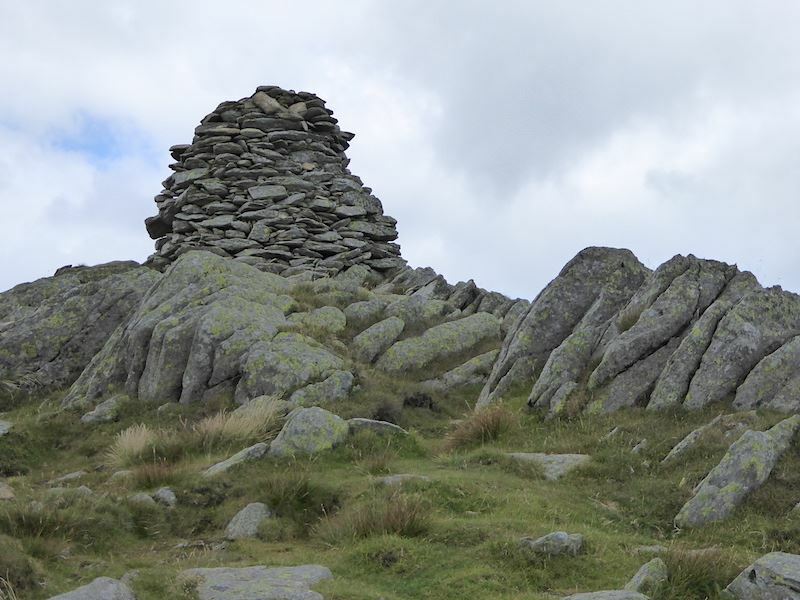 The largest of the three cairns on Ill Bell, I hid the cairn hoggers behind the cairn. 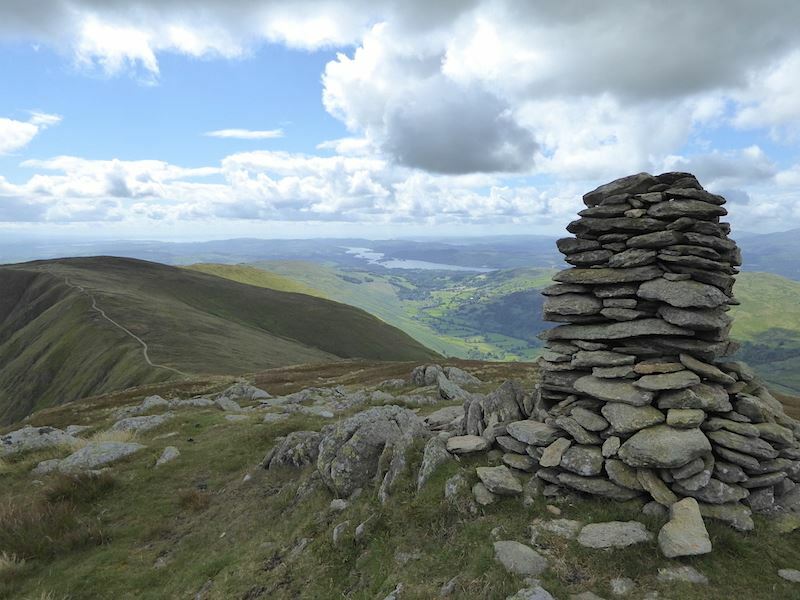 Looking south from the largest cairn to the lowest one and on to Windermere. 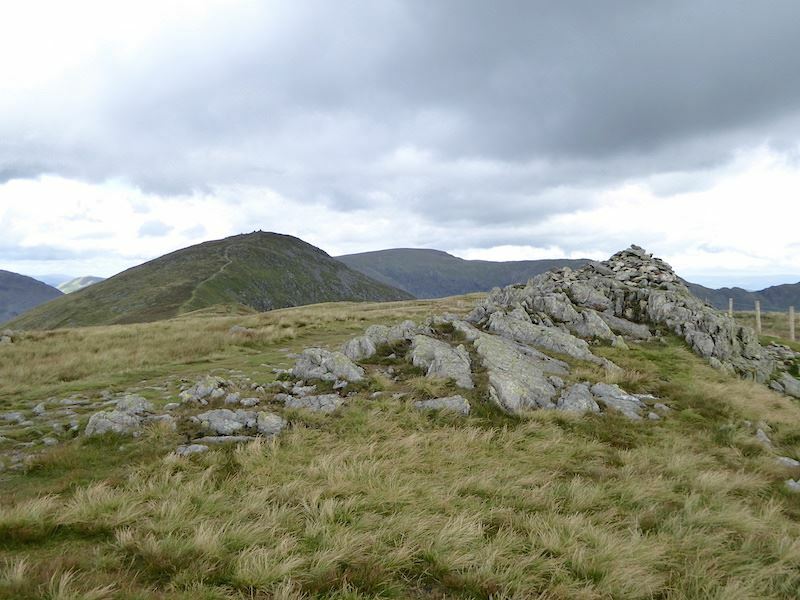 The cairn hoggers were just to the left of the nearest cairn. The third cairn on Ill Bell, cairn hoggers sitting immediately to the right of the cairn so I had to miss out a bit of cairn to avoid them. 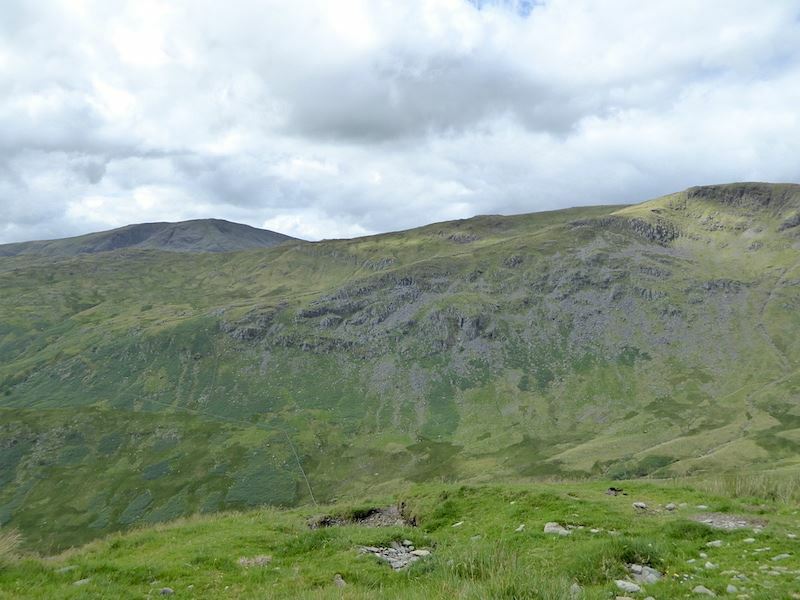 The cloud dappled fells of Froswick on the left, immediately behind is Thornthwaite Crag, in the centre is High Street, and on the right is Mardale Ill Bell. 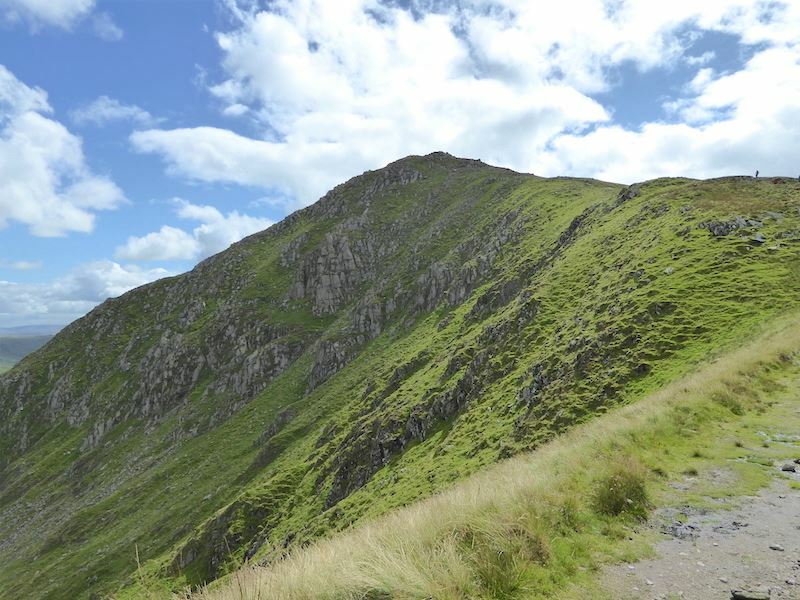 Moving a little to the left, in the centre is Caudale Moor and its summit of Stony Cove Pike. 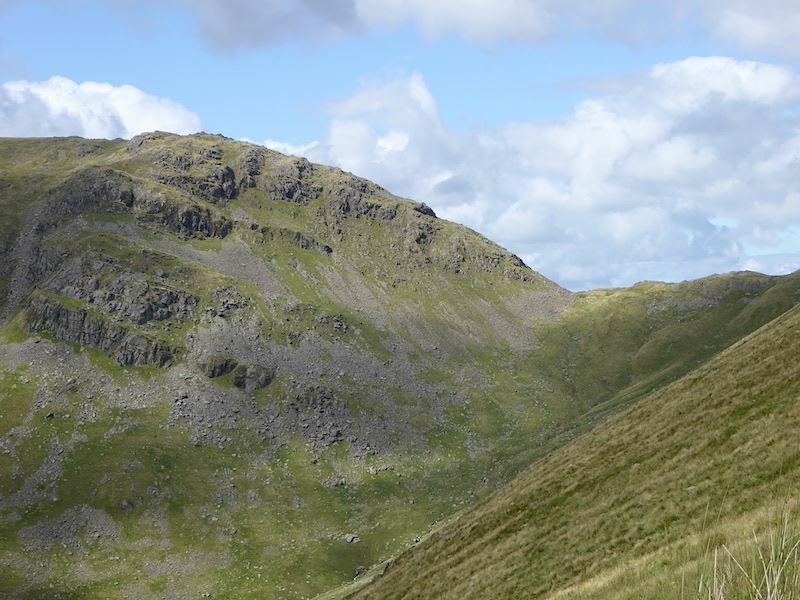 Immediately below us is the ridge we’ll walk over to get up to Froswick. 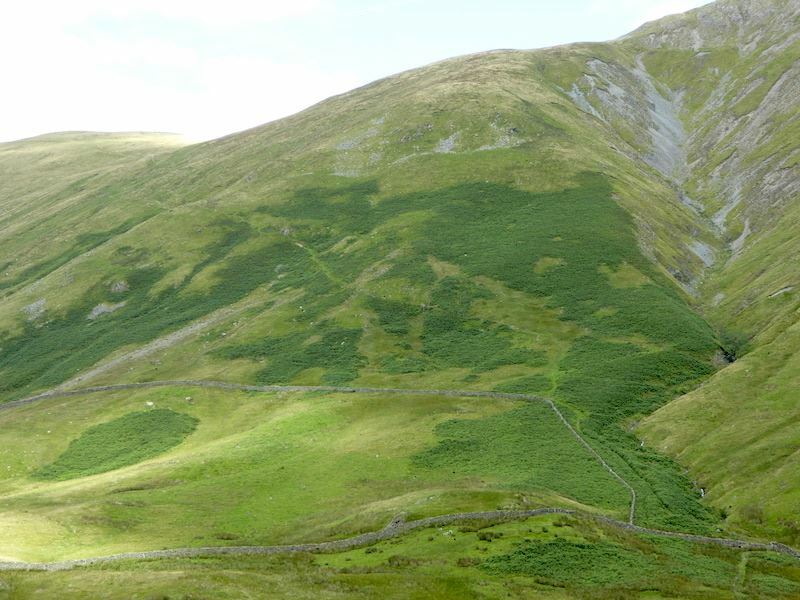 From Ill Bell we set off for Froswick up the path to the right. 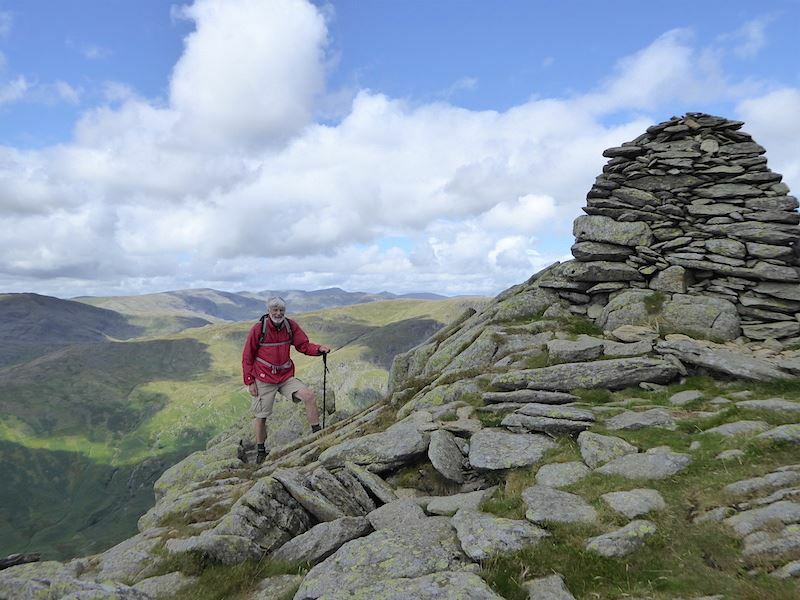 On the skyline beyond is the Beacon, the summit of Thornthwaite Crag. 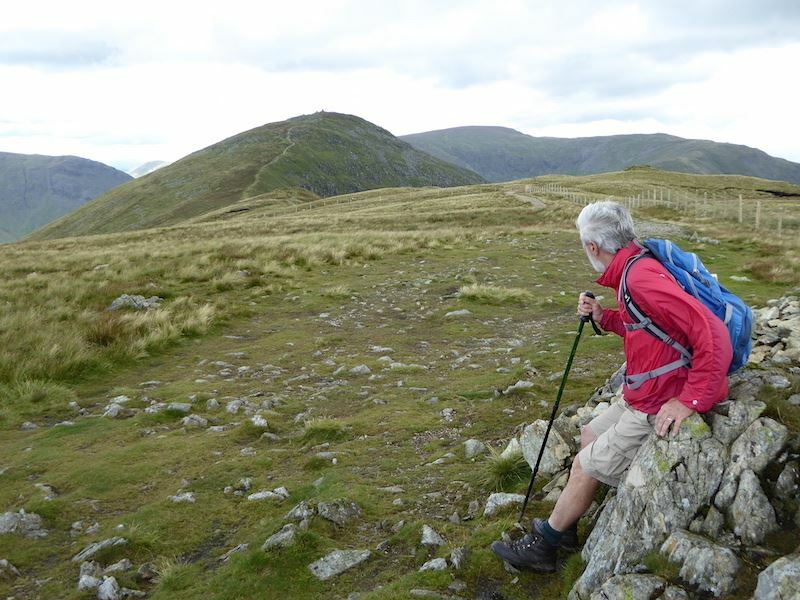 A look back at Ill Bell as we take the path over to Froswick. 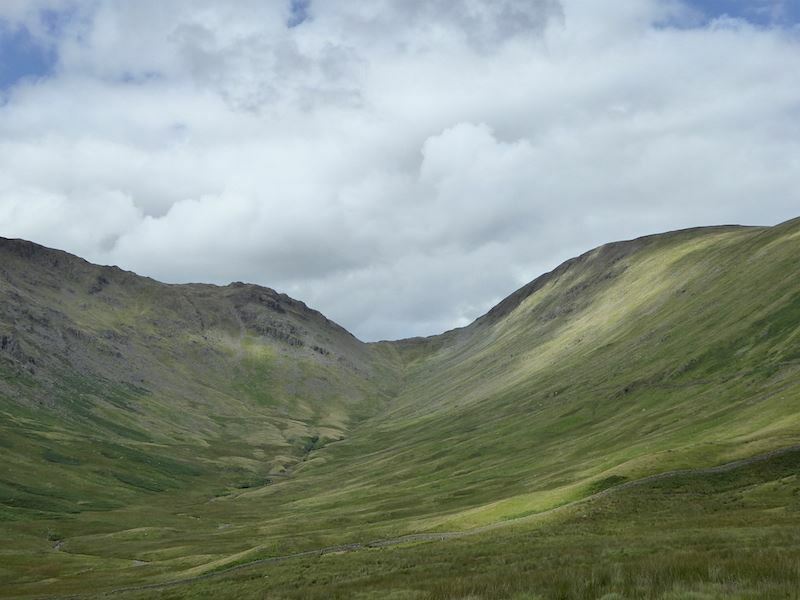 On the path to Froswick. 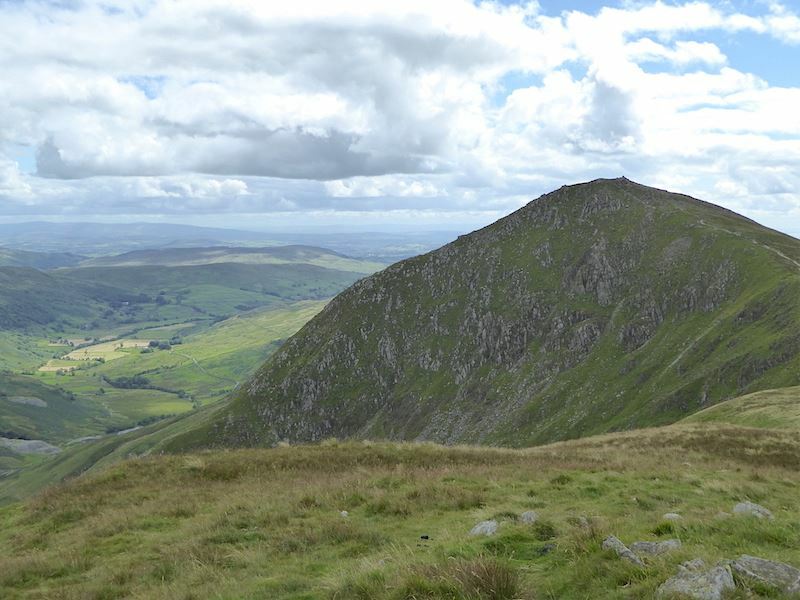 The flat topped summit of Harter Fell across the valley. 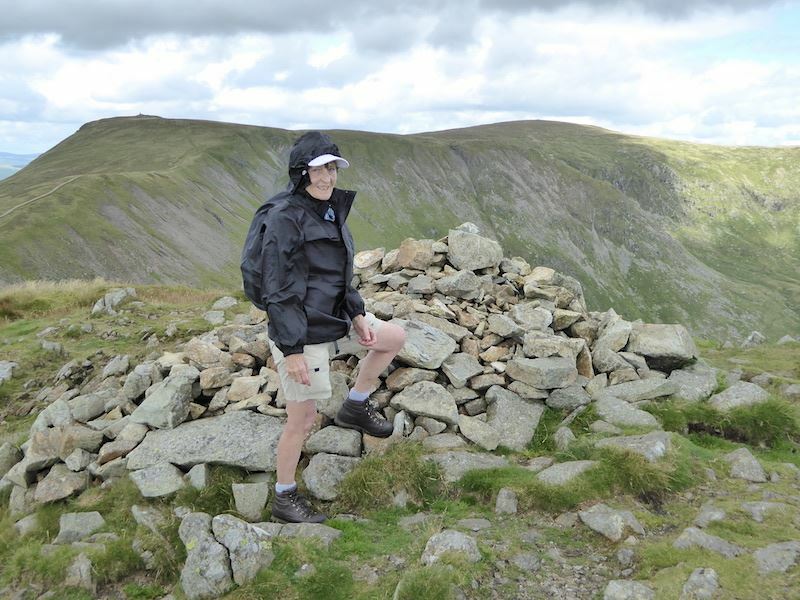 Frozen on Froswick. The wind is blowing into my jacket, the hood was needed to keep my sun cap on, (what sun?) and my gloves would have been better on than in the rucksack. 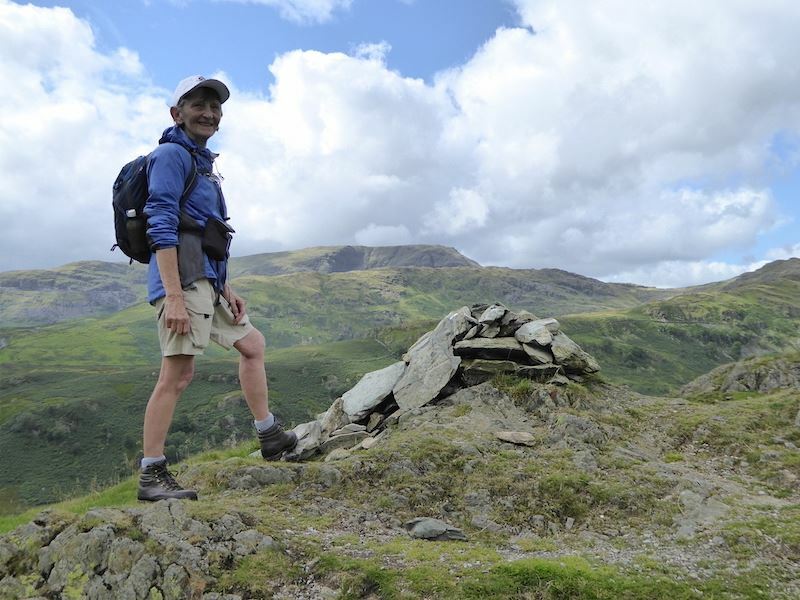 The shorts were definitely an error of judgement, although when we left home it was a better day than this. 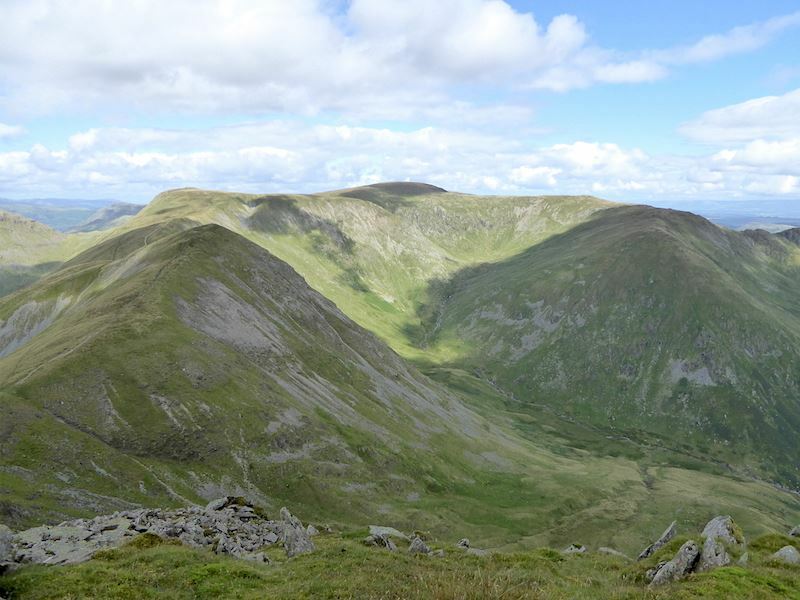 Looking back to Ill Bell from Froswick. 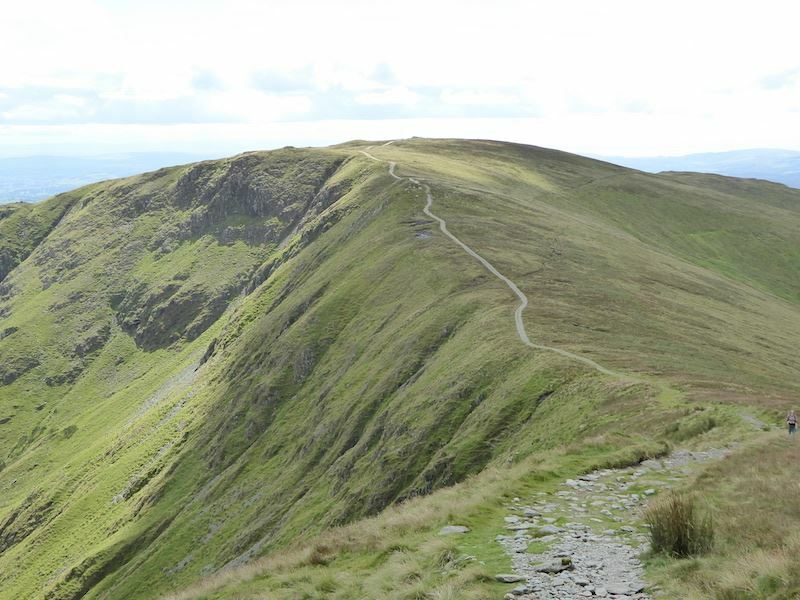 Ill Bell again, this time looking down the Kentmere side of it. 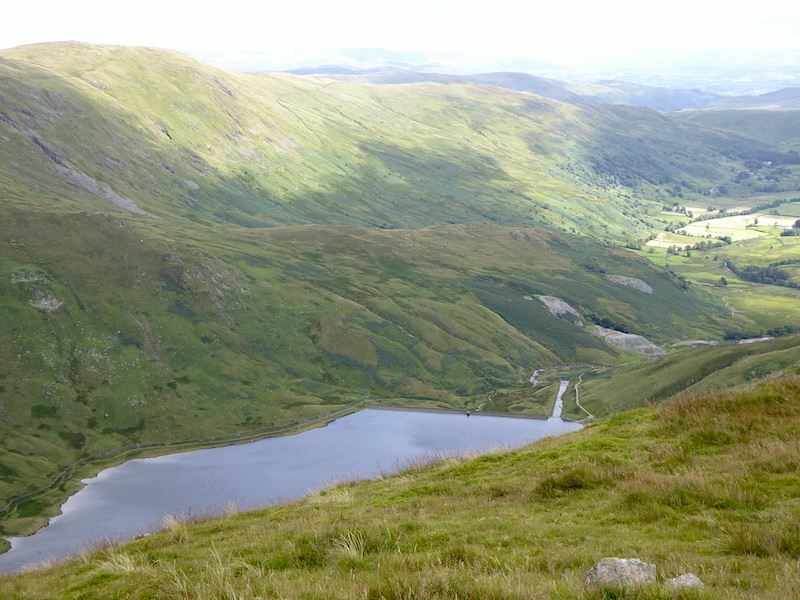 The Kentmere reservoir and valley. 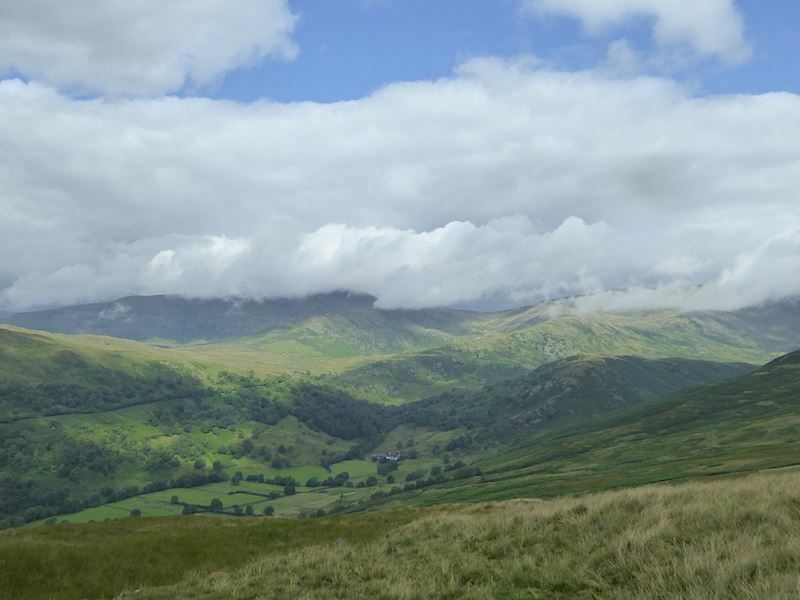 On the left the gloom has lifted off Kentmere Pike and Shipman Knotts. 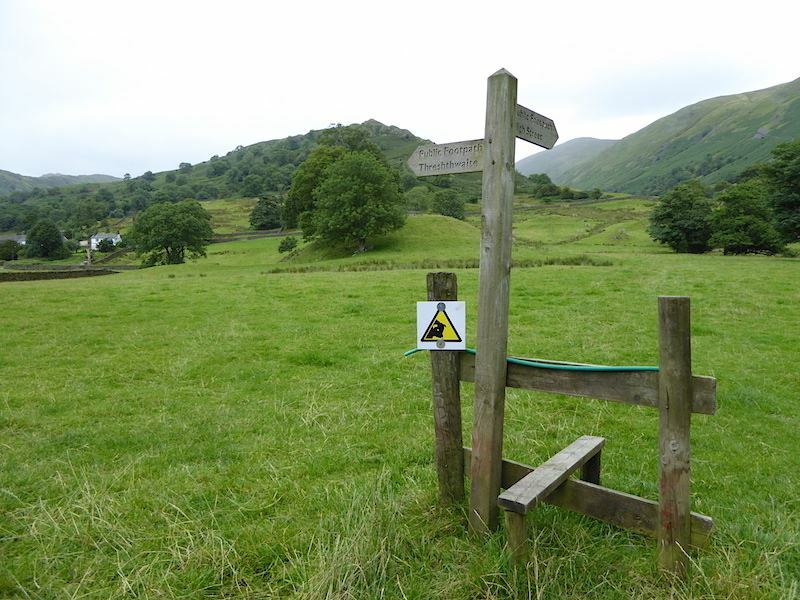 After our descent from Froswick we took a left turn off the path to head down into the Troutbeck valley. A little way down this path we stopped for lunch in a sunny spot with some shelter from the wind. 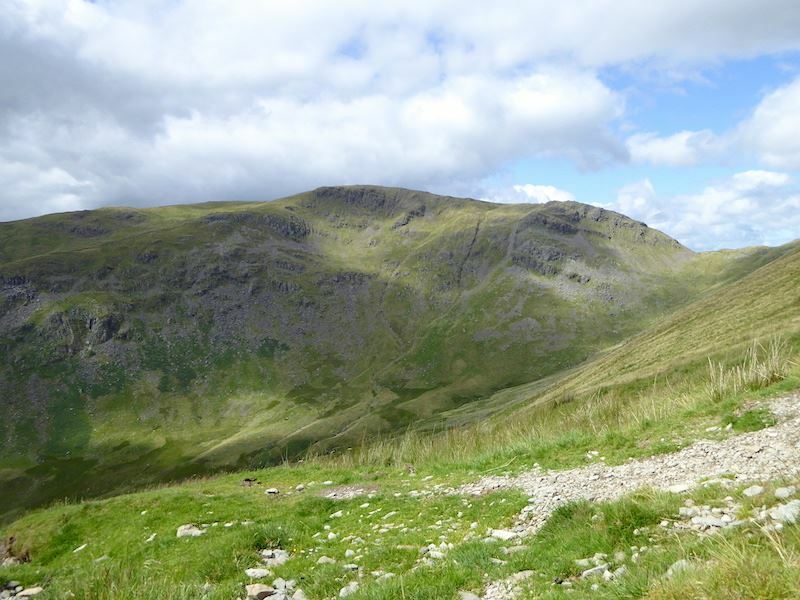 From our lunch spot we had a good view of Thresthwaite Mouth, Going up the crags on the left leads to Stony Cove Pike. 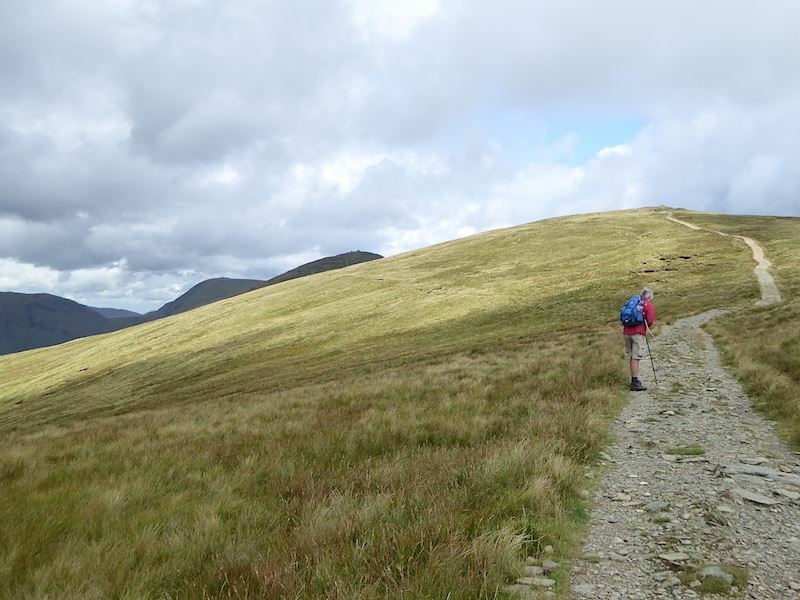 Continuing across to the right would lead you up to Thornthwaite Beacon. A longer view from our lunch spot. 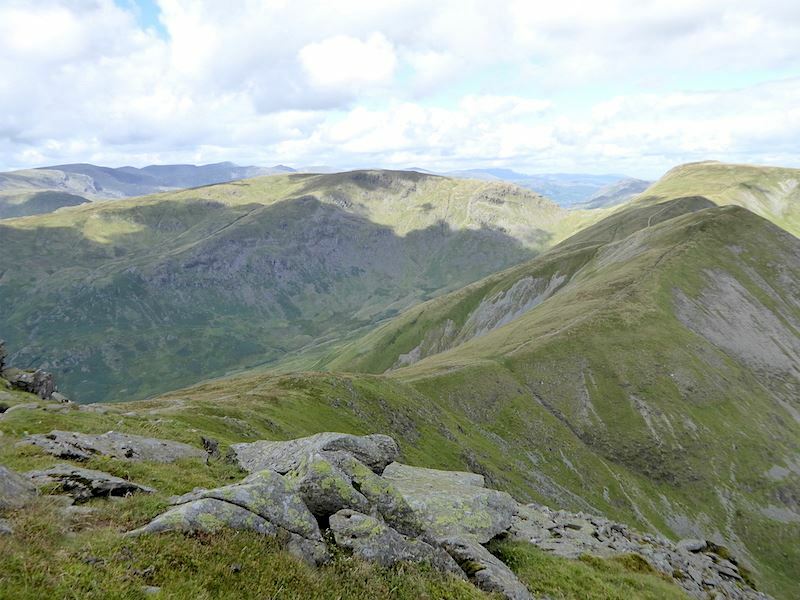 Also from our lunch spot, a view over to Red Screes on the left skyline. 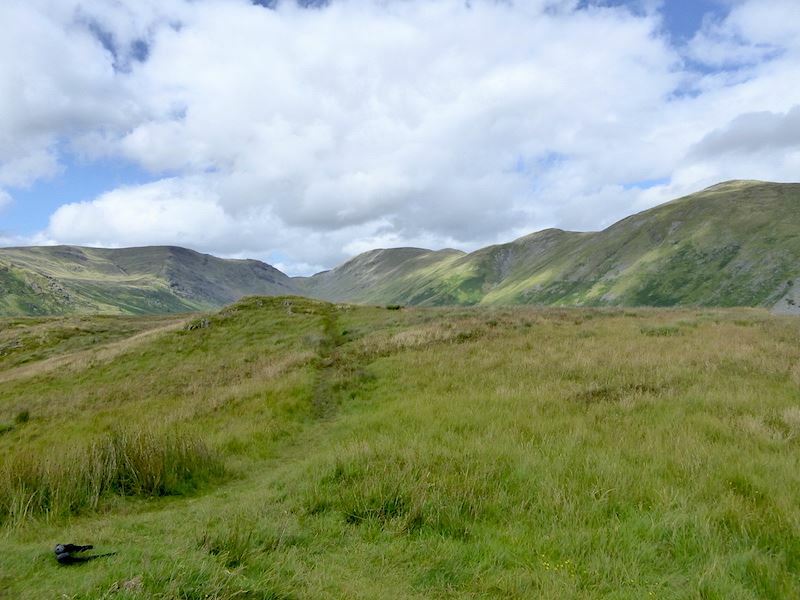 After lunch we take the Scot Rake path down to Troutbeck Tongue, that’s the small hill down there in the centre. 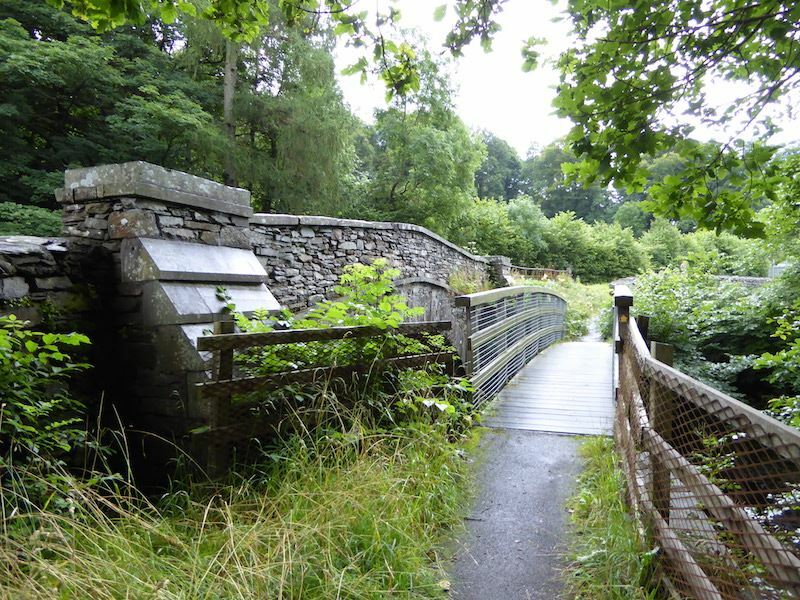 The Tongue has a beck on either side of it, over on the right is Trout Beck and on the left is Hagg Gill. 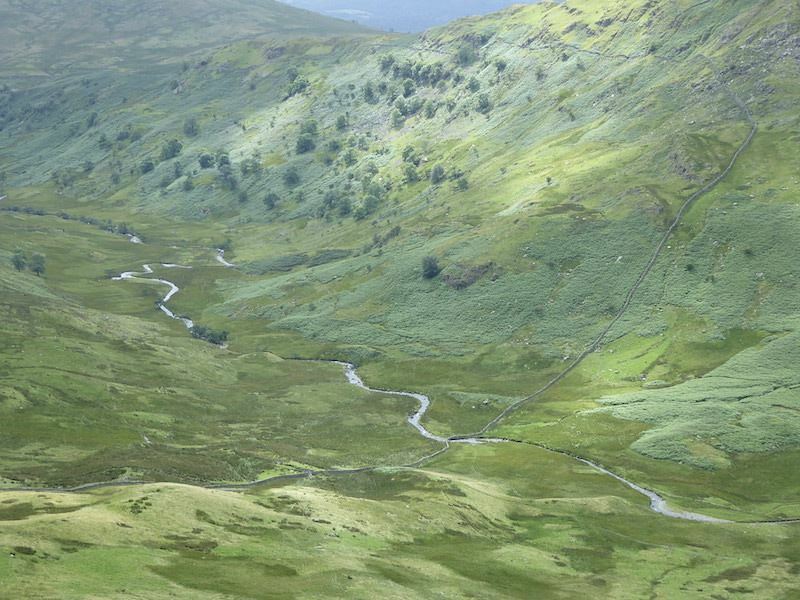 Looking down at Trout Beck. 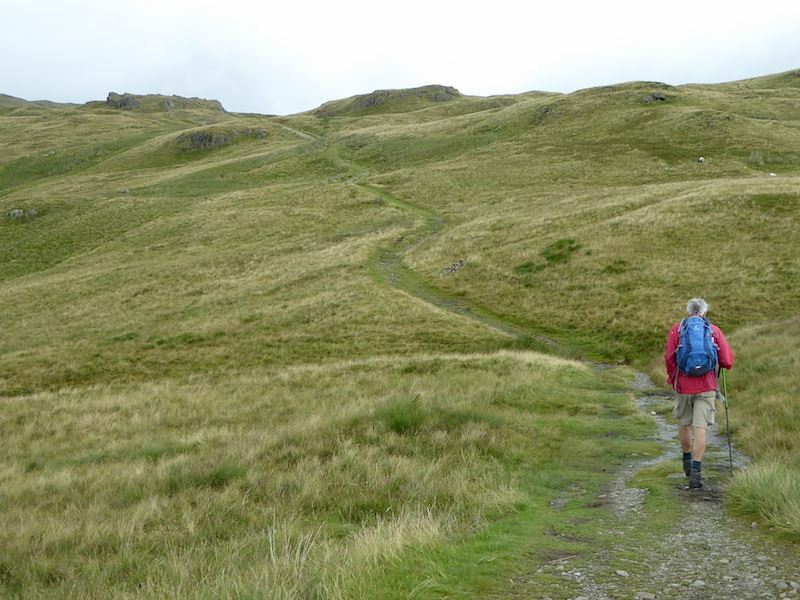 Descending by Scot Rake, a lovely path down to Troutbeck Tongue. Even after all that rain yesterday it wasn’t as soggy as I had thought it might be. 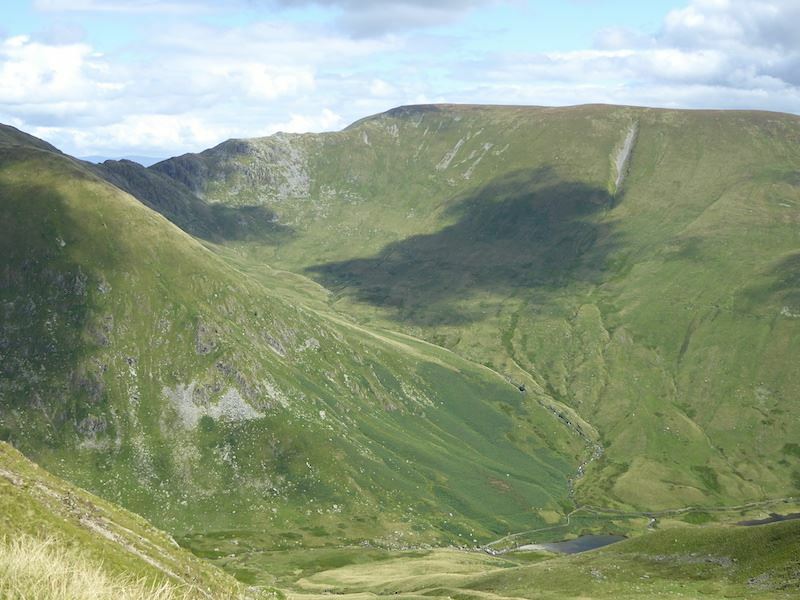 A look back up to Thresthwaite Mouth, which shows the steep climb to the right up Thornthwaite Crag. 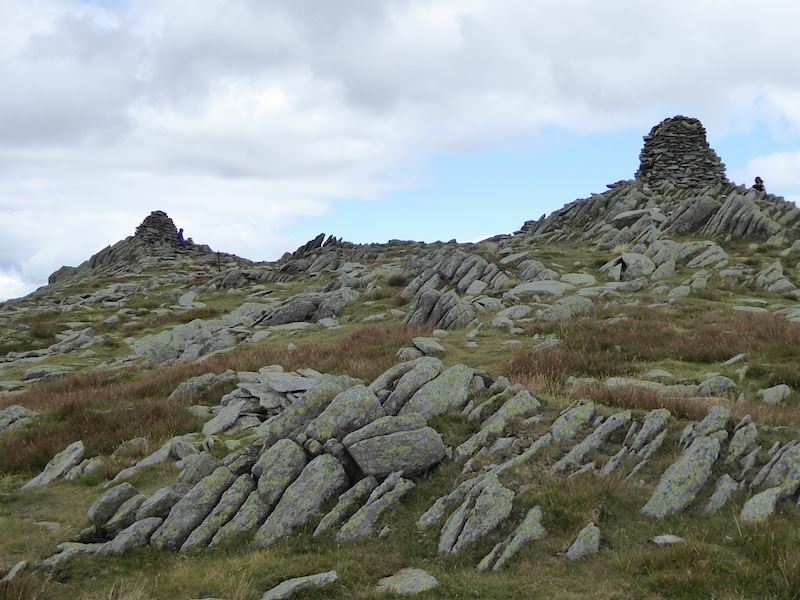 We climbed up the back of Troutbeck Tongue and came across these structures. 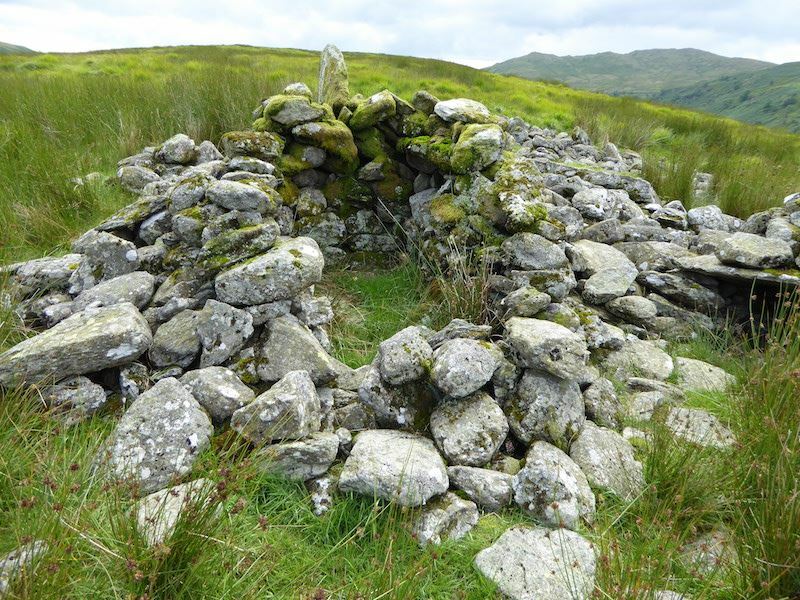 They are marked as cairns on the OS maps but cairns aren’t usually hollowed out and shaped like a bath. I’ve no idea what purpose they might have had originally. 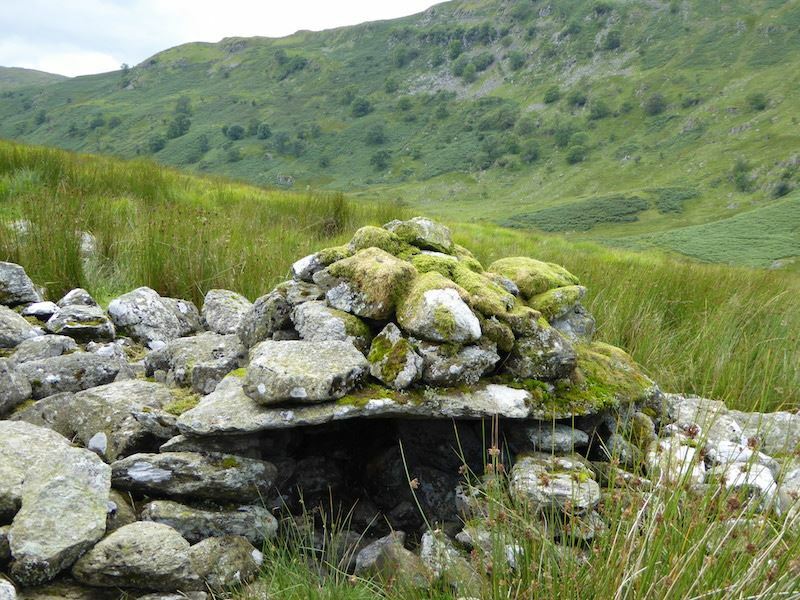 This is a much smaller structure situated by the side of the previous one. To give you some idea of size only a small dog could curl up in here. 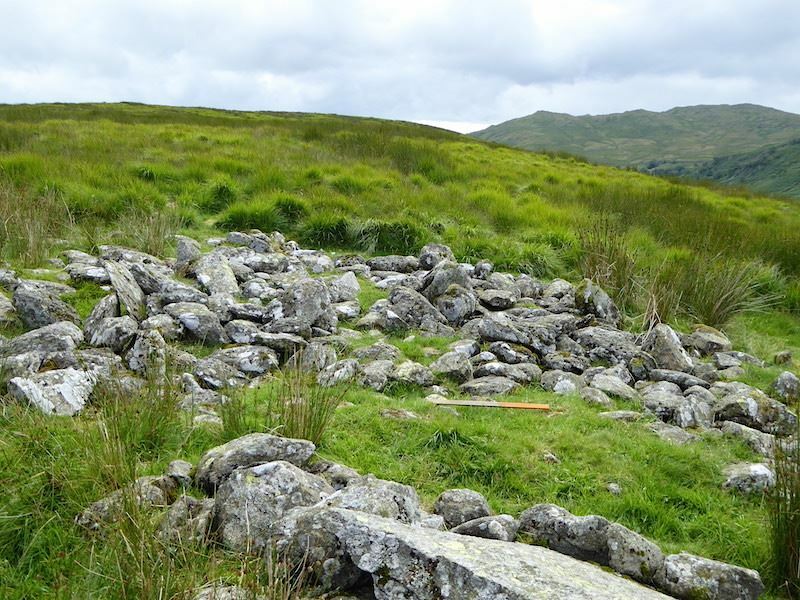 Just beyond the two previous ones was this scattering of stones, roughly circular in shape. 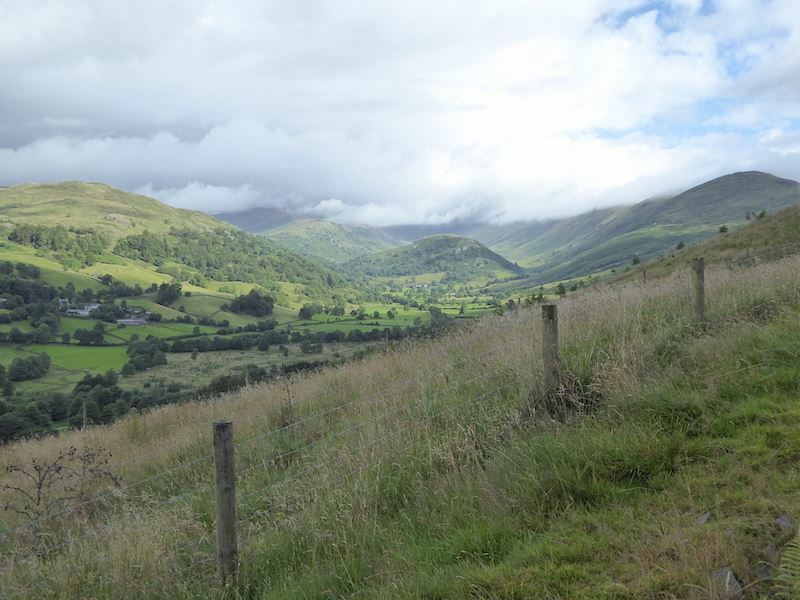 Looking back up the Troutbeck valley. 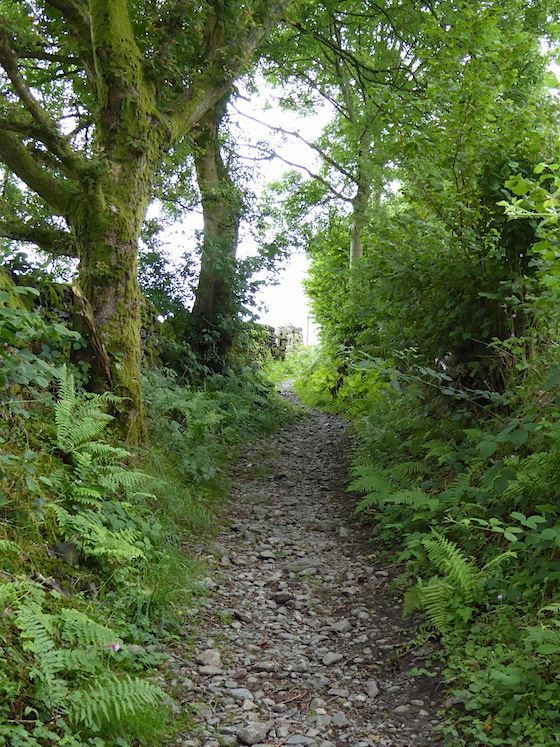 Running through the bracken on the hillside is the path, known as Scot Rake. 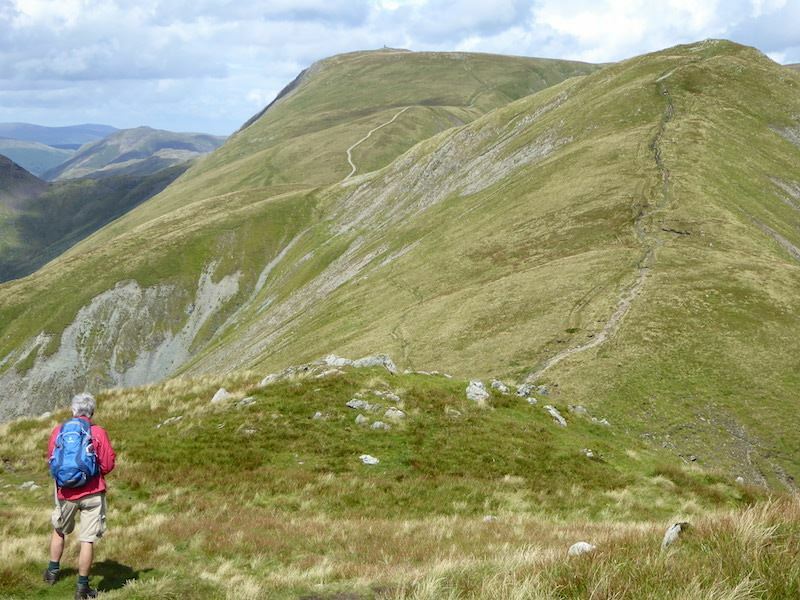 we followed down from Froswick. 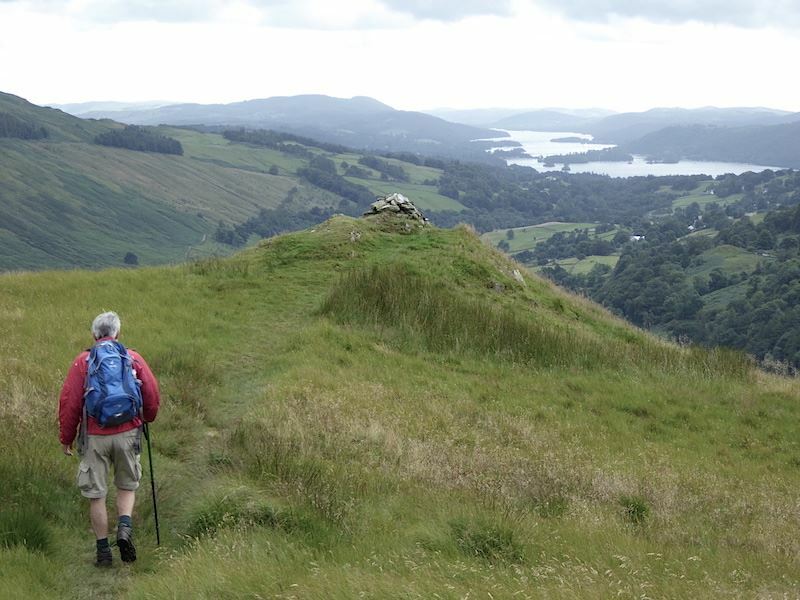 Approaching the cairn on Troutbeck Tongue with Windermere in the background. 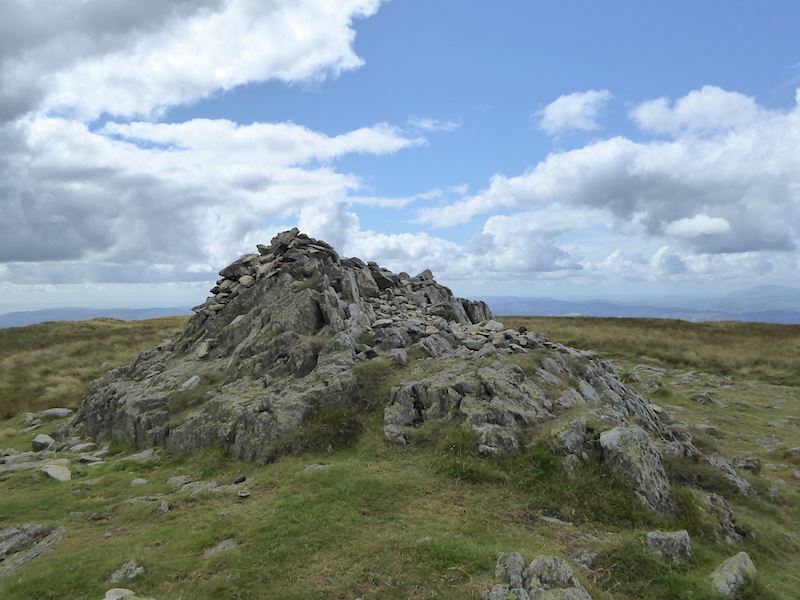 The cairn is a few yards south of the highest point but the views are better from here. 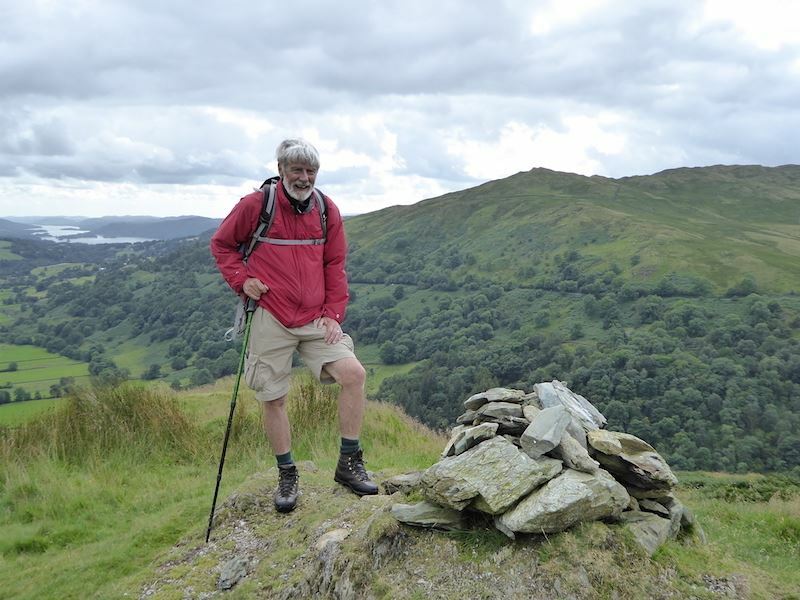 On Troutbeck Tongue, with Windermere over on the left and Wansfell to the right. 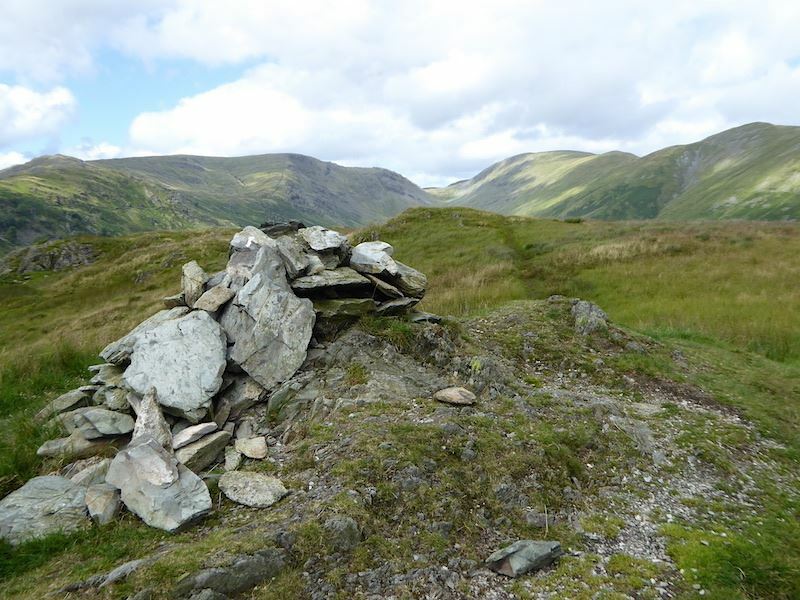 Red Screes on the skyline from Troutbeck Tongue cairn. 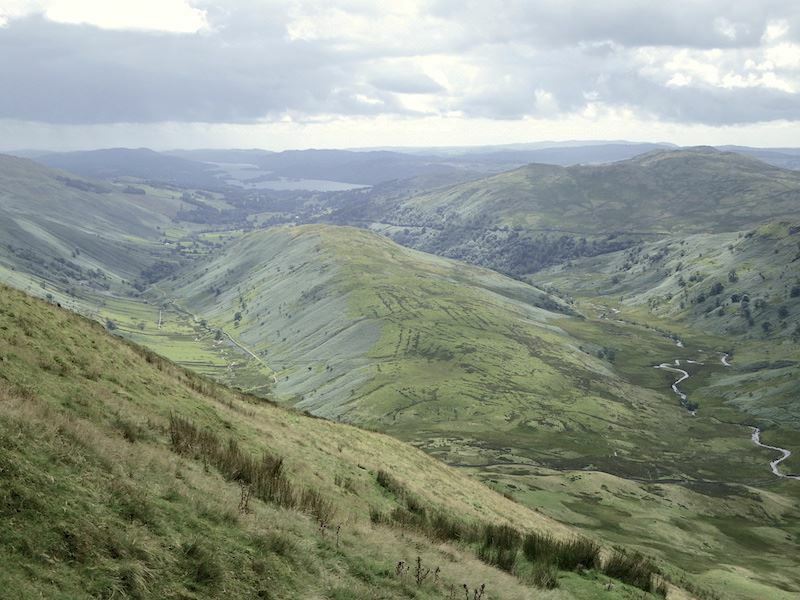 Looking northwards from Troutbeck Tongue. 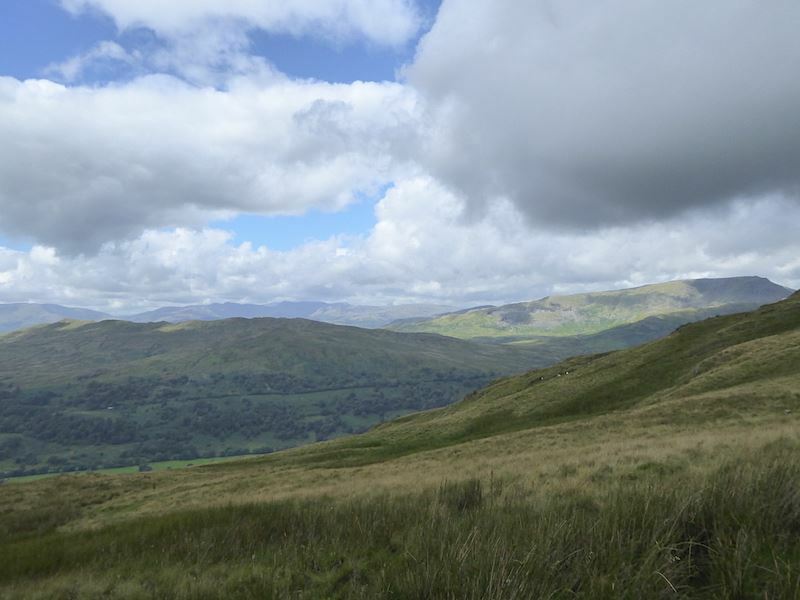 Looking north-westwards from Troutbeck Tongue. Looking northwards again as the sun made another brief appearance. 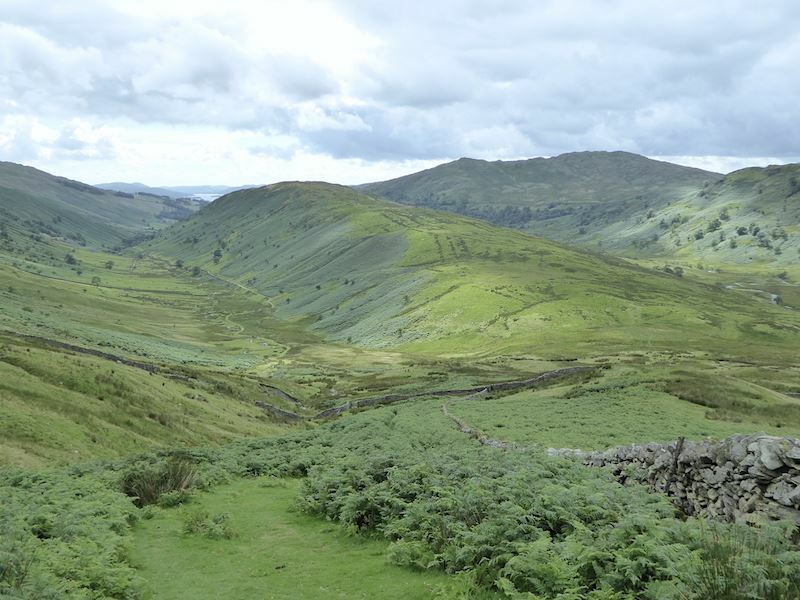 Looking back to Troutbeck Tongue from the superfluous (at present) stile in the valley. It’s used, when necessary, to carry an electrified fence wire across the field. Ing Bridge looking less than charming. 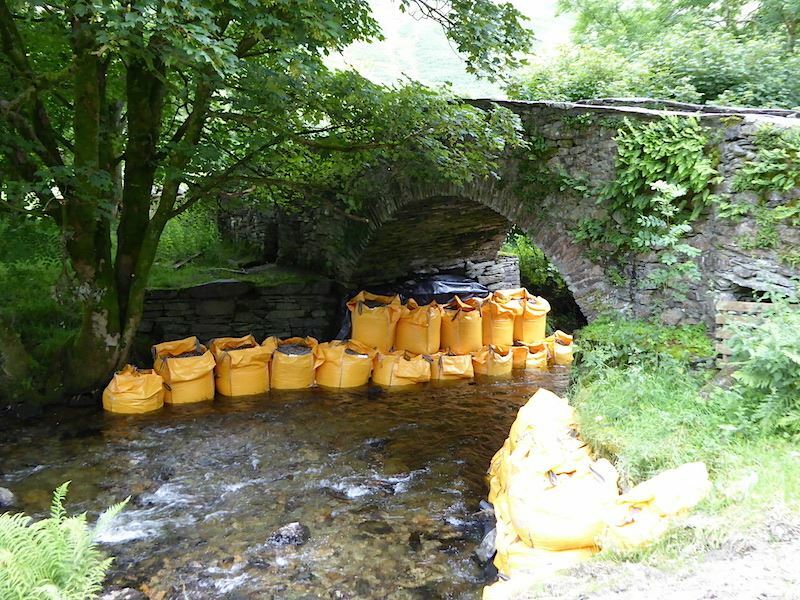 Large bags filled with gravel on both sides seemed to be there to support the bridge. Did they have to be such a garish yellow, why not use a colour which blends in with the surroundings? 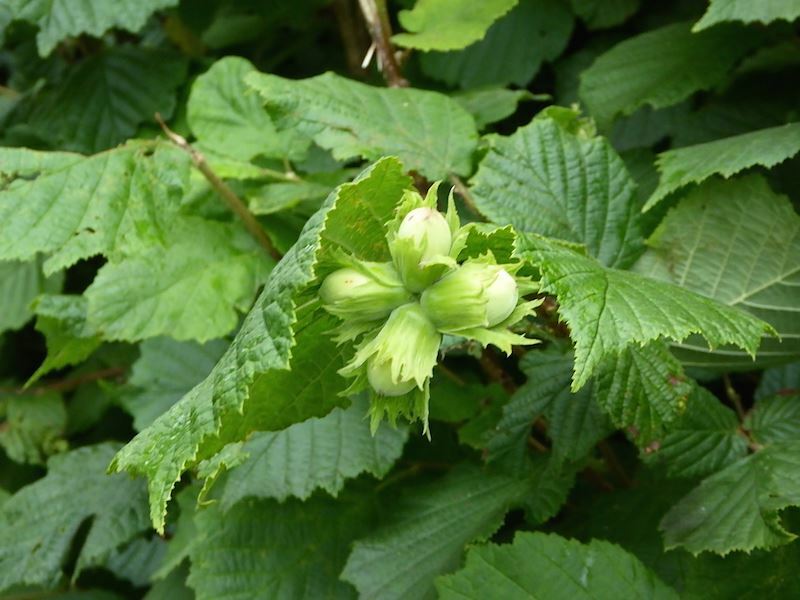 The appearance of hazel nuts along the hedgerows, a small sign of the seasonal changes to come. 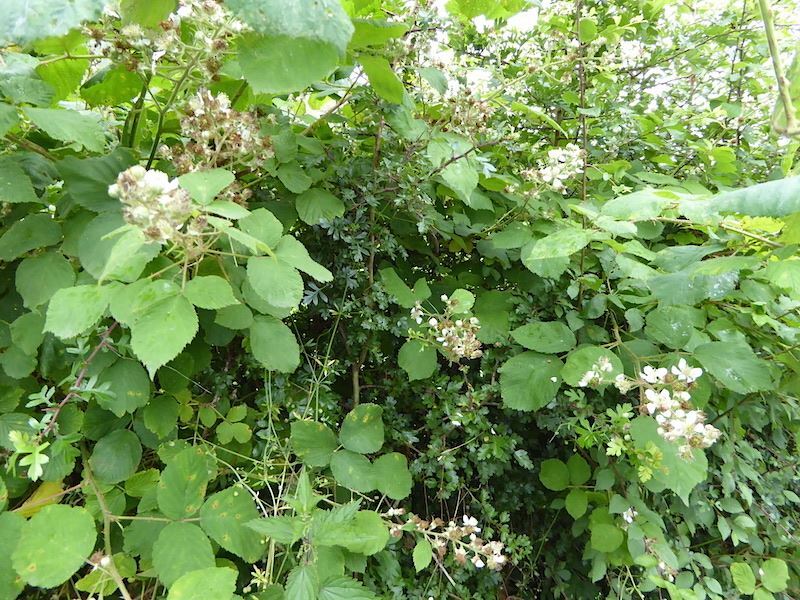 Looks like the blackberry harvest will be good this year. 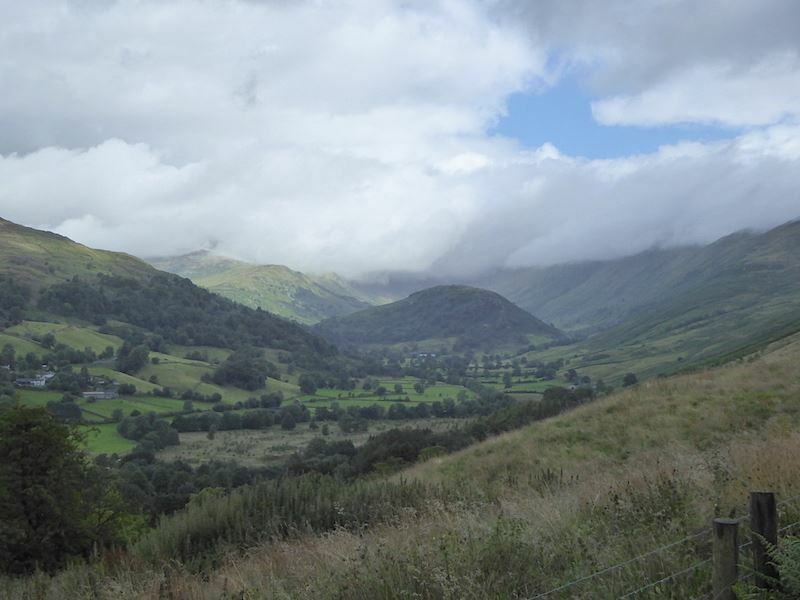 Looking back up the valley as we head for the village of Troutbeck. Reaching the end of Truss Lane. Passing Limefitt Holiday Park as we make use of the new path which avoids walking on the busy A592. 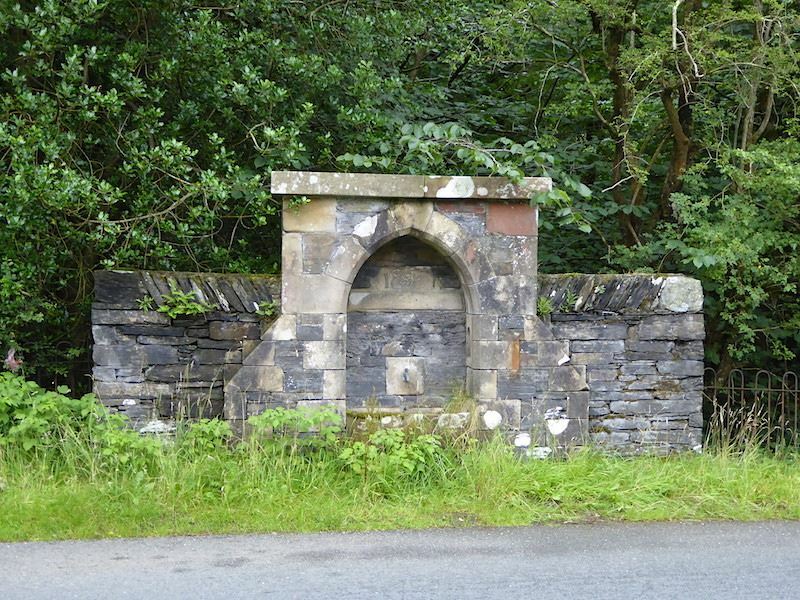 One of the old wells in Troutbeck village. 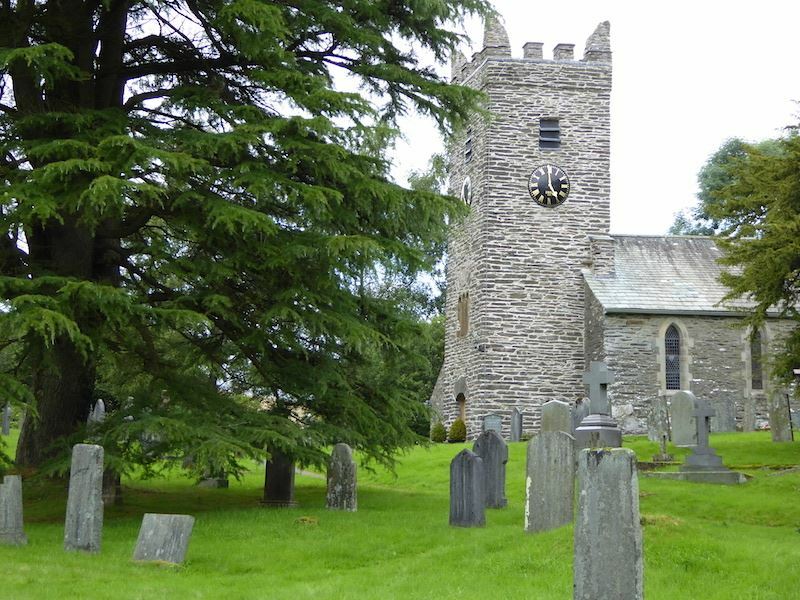 Troutbeck Church, the clock telling us that its exactly seven hours since we left here this morning, and that its now time to head for home and get the kettle on.